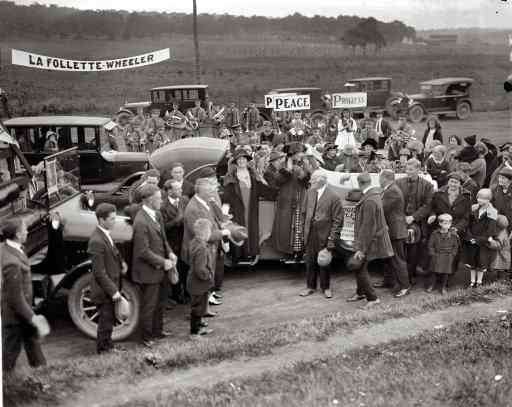 National Photo Co. Peace and Progress September 29, 1924. "Mrs. LaFollette at Mountain Lake Park, Maryland." Ilargi: Looking at the fall-out from the Fannie and Freddie bottomless pit bail-out, I can’t help combining in my head the financial news with reports on the Hadron particle accelerator. Protesters claim it could create black holes. And I’m thinking: guys, if black holes are your thing, you should be watching Wall Street. After yesterday’s market losses, it’s obvious that hardly anybody was fooled for more than 24 hours into thinking that the unlimited bail-out would calm investors, or stabilze mortgage rates, or anything of that sort. And I’ll repeat once again that it can’t. Calling a bottom in this market is a very simple thing to do, it’s just that no-one wants to do it, for good reasons perhaps (fear). The mayhem hasn’t even started for real yet: the problems will be solved when both of the following issues have been fully addressed. First, home prices will have to go down to trendline levels; to do so, they will need to lose around 65% of their 2005-6 peak levels. They are down about 20% today, according to Robert Shiller. Because swings of this magnitude are always intensified by sheer momentum, the losses, as I have said 1000 times, will be close to 80%. Second, the securities, derivatives and other casino toilet paper that reside in the vaults of banks, pension funds, money funds and elsewhere, will have to be exposed to daylight and valued at the market price of the day, not that of 10 years ago or 10 years in the future. This is called mark-to-market, and it gets harder to avoid it, try as they all might. Until these two conditions have been met, the only result of actions such as the Treasury "rescue" of Fannie and Freddie will be one, and one only: the transfer of public funds, revenue drawn from taxpayers past, present, and future, into private coffers. And no, I do not believe that is an unintended consequence. The news of the day: everyone’s eyes are fixed on Lehman, which lost 44.95% yesterday. Today, Lehman faces failed take-over talks with suitors like the Korean Development Bank. Ostensibly over the price it asks for itself, but I bet you that in reality it’s over the "assets”, the toilet paper, that Lehman holds. The bank is now trying to sell its asset-management division, Neuberger, but that only reveals the next problem: investors value Lehman at the same price as Neuberger. So if they sell it, Lehman has ZERO value. Expect another rescue from Paulson and the Fed very soon, if Lehman keeps plunging. Interestingly, as Lehman is up a few points this morning, its holding company scrapes the bottom of the barrel. It's like the Russian dolls. More fall-out. The Fannie and Freddie purchase by the American public included a sucker punch hit for holders of preferred shares. Many of those holders were smaller US banks. The halt in dividend pay-out on the shares is bad enough for many of them. But that’s not all: to (re-) finance their debt, they would like to (as usual) issue shares, including preferred shares. But who now is still nuts enough to buy that stuff? It could be wiped out tomorrow morning, if the Treasury pulls the same stunt again. Talk about a double whammy! And that’s not all (nothing is these days, it seems). Banks have to write down an estimated $30 billion on the preferred shares boondoggle. Which, in fractional banking terms, means that another $300+ billion in credit leaves the country. As a result of a bail-out promoted as intended to make credit (mortgage loans) more accessible. So look beyond Lehman. Watch what happens to Fifth Third, Key Corp, Wachovia. They are all bleeding now. What really scares me today, though, is Washington Mutual. Down 20% yesterday, and the same today. WaMu is the United States' largest savings and loan association, with 2600 offices, the third largest mortgage lender (!! ), and 9th largest credit card company. If WaMu fails, we will see the Treasury need to bail out the FDIC soon, just because of its size. And then there’s no telling how other commercial banks will fare. Or your allegedly "guaranteed" deposits. WaMu is the proverbial big fish. Make that BIG FISH. A fuzzier subject when it comes to the infamous biggest bail-out in history (until the next one) is the effect it has on credit default swaps and, with it, the entire derivatives market. Most of it is too opaque to call, but we know there are hedge funds deep in Fannie and Freddie swaps, for whom things changed a lot overnight. CDS are nothing but bookie bets with a glamorous and legal veneer. Their estimated total is $62 trillion, and it’s very hard to estimate what part of that would have to be paid out. But don’t be surprised if it turns out to be 10%, or even more likely 20%. We haven't even started yet on the way down, this is just the engines warming up. Lots of noise, but no movement. Home prices down 80%, and toilet paper out in the open. Those are your clues. Any claim until then is fake. Treasury Secretary Henry Paulson's takeover of Fannie Mae and Freddie Mac is roiling the market for preferred securities. Prices of fixed-rate preferred stock fell an average of 9 cents to 71.5 cents on the dollar this week, according to Merrill Lynch & Co. index data, the biggest two-day drop in more than a decade. The 11 percent decline compares with a 1.4 percent drop in the Standard & Poor's 500 index over the same time. In putting Fannie and Freddie in conservatorship, Paulson scrapped dividends on the mortgage finance companies' equity securities and said the U.S. would buy as much as $200 billion of preferred stock ranking ahead of existing issues. Investors are more hesitant to invest in similar securities of other financial institutions on concern Paulson set a precedent for issuers. Unlike common stock, preferreds typically carry fixed dividends. Paulson's "actions have damaged the preferred market," said Thomas Hayden, the investment strategist for Liberty Bankers Life Insurance in Dallas. "Somebody is going to be looking at an issue of Fannie or Freddie preferred shares that were rated AA up until a few months ago. If that's not money good then what about the small regional bank in some part of the country?" Hayden, whose $1.5 billion fixed-income portfolio contains preferred shares of Fannie and Freddie, said he's "not interested" in buying any more preferred securities. The market's tumble is making it more expensive for banks and brokers trying to raise fresh capital after taking $506 billion of writedowns and losses on the collapse of the subprime- mortgage market. Sales of preferred securities in the U.S. have risen 48 percent this year to about $44 billion from more than $30 billion in the same period of 2007, according to data compiled by Bloomberg. The average yield as measured by the Merrill index has risen to 10.1 percent from 8.8 percent on Sept. 5 and 7.9 percent at the end of last year. The takeover was "unambiguously bad" for preferred investors and "likely set a precedent for any future rescue transactions," Kathleen Shanley, an analyst at bond research firm Gimme Credit LLC in Chicago, wrote in a Sept. 7 report. Preferred shares of Washington-based Fannie and Freddie of McLean, Virginia were cut to the second-lowest rating by Standard & Poor's and Moody's Investors Service on Sept. 7. The grades were slashed 11 levels by S&P to C and 10 rankings to Ca by Moody's. Moody's rated their preferred stock Aa3, the fourth- highest grade, until July. Freddie preferred shares have lost 83 percent the past two days, while Fannie's have declined 80 percent, the biggest losers in the Merrill index. The two companies account for about $24 billion of the $190 billion par amount in the index. Forty of the top 50 issuers have declined in the last two days. The declines are particularly stinging for Fannie and Freddie investors because the companies have sold $20.4 billion of the preferred securities since November. Paulson tried to calm preferred stock investors when he announced the rescue of the government-sponsored enterprises and said the takeover shouldn't have negative implications for the wider market. "Preferred stock investors should recognize that the GSE's are unlike any other financial institutions and consequently GSE preferred stocks are not a good proxy for financial institution preferred stock more broadly," Paulson said in a Sept. 7 statement. "The broader market for preferred stock issuance should continue to remain available for well-capitalized institutions." Lehman Brothers Holdings Inc. is down 42 percent, while Merrill Lynch has tumbled 16 percent. "In the primary market it's going to be much more difficult for financials across the board," Hayden said. "If Lehman Brothers thought they needed to go to the market and had any chance at all of issuing preferred stock to raise capital, it is now three times more difficult than it was last Friday." Investors will be "gun-shy" about buying preferred shares, said Thomas Houghton, who manages $2 billion of corporate bonds at Advantus Capital Management in St. Paul, Minnesota. "There are a number of financial institutions that are experiencing distress right now, so the dividend on the common and the preferred share are going to be the first to go," he said. Lehman Brothers Holdings Inc., the fourth-largest U.S. securities firm, reported a $3.9 billion third-quarter loss and said it plans to sell a majority stake in its investment-management unit as it struggles to survive a crisis of investor confidence. "This is an extraordinary time for our industry and one of the toughest periods in the firm's history," Chief Executive Officer Richard Fuld said in a statement today. Analysts surveyed by Bloomberg estimated the New York-based firm would report a $2.2 billion loss. The credit-market meltdown has led to more than $500 billion of writedowns and credit losses since it began a year ago, sending financial shares around the world swooning. Lehman lost 88 percent this year, the worst performer on the 11-company Amex Securities Broker/Dealer Index. Lehman Brothers is still playing for time. The brokerage firm warned Wall Street Wednesday it will post a second straight quarterly loss, and offered up a roadmap to a slimmed-down future. But investors weren’t impressed, and the sharp premarket rally that had taken Lehman shares back up to $10 from their close below $8 Tuesday dissipated. Lehman set plans to auction a majority stake in its Neuberger Berman investment business. Lehman also said it will slash its quarterly dividend to just over a penny from 17 cents, and will seek to spin off some of its commercial mortgage holdings into a new company. But if anything, questions about Lehman’s future remain just as weighty in the wake of Wednesday’s announcement as they did Tuesday, when the stock plunged 45% following the collapse of talks with Korea Development Bank over a possible investment in Lehman. One sore point is that Lehman’s plans, as outlined Wednesday, are just that and nothing more. The firm still hasn’t lined up a buyer for a stake in Neuberger, which will raise suspicions that CEO Richard Fuld - even after the firm’s signal failure to raise capital over the past month despite multiple rounds of talks with various parties - is still trying to squeeze more out of buyers than they’re willing to give in a risk-averse, loss-soaked market. Questions about how Lehman will raise capital are only more pressing after Lehman’s latest numbers. The company said it expects its third quarter to swing to a loss of $3.9 billion, or $5.92 a share, reversing the year-ago profit of $887 million, or $1.54 a share. The latest quarter showed negative revenue of $2.9 billion, as Lehman took mark-to-market writedowns of $7.8 billion, largely on its commercial and residential mortgage holdings. Analysts surveyed by Thomson Financial were looking for a loss of $3.35 a share on revenue of $286 million. Lehman has now posted negative revenue two consecutive quarters. The announcement comes a day after shares in Lehman plunged 45% to a 10-year low after the company failed to sell a stake to a group led by Korea Development Bank. The selloff prompted Lehman to accelerate by a week the release of its expected third-quarter earnings and to offer details of its plans to remedy the losses that have led Wall Street to doubt the staying power of the 158-year-old firm and Fuld. “What they need to do is reassure the market they aren’t running out of time,” Sanford C. Bernstein analyst Brad Hintz, a former Lehman finance chief, said Wednesday morning on Bloomberg television. He says, looking at the bright side, that the firm isn’t going to succumb to a funding run due to the Federal Reserve lending facilities put in place after the collapse of Bear Stearns. But while Fuld said in a press release that the company is determined to “fundamentally reposition” itself, it’s beginning to look like Fuld is the one who has to reposition his expectations - or give way as CEO to someone who will. Lehman Brothers Holdings Inc. , the fourth-biggest U.S. securities firm, said it plans to sell a majority stake in its asset-management unit and spin-off commercial real-estate holdings in an effort to shore up capital and regain investor confidence. Lehman, in a statement today, reported a $3.9 billion third-quarter loss on $5.6 billion of writedowns. Analysts surveyed by Bloomberg expected the New York-based firm to report a $2.2 billion loss. The company said it plans to complete the asset-management sale in an auction, without naming potential bidders. The real estate spin-off is expected to be completed in the first fiscal quarter of 2009, according to the statement. Pressure on Lehman's Richard Fuld, the longest-serving chief executive officer on Wall Street, mounted yesterday after talks with Korea Development Bank ended, sending the shares tumbling 45 percent. Fuld is striving to convince investors that the 158-year-old bank will stem losses as house prices decline. He and his management team also must keep clients and employees from leaving the firm. The global credit-market meltdown has led to more than $500 billion of writedowns and credit losses since it began a year ago, sending financial shares around the world swooning. Lehman, the worst performer on the 11-company Amex Securities Broker/Dealer Index this year, has lost 88 percent. The New York-based securities firm moved its third-quarter earnings announcement up a week to today, after a person familiar with the matter said yesterday that talks with state- owned Korea Development had ended. The Wall Street investment bank has been in talks with Kohlberg Kravis Roberts & Co., Carlyle Group and other private- equity firms interested in buying its asset-management unit, which includes fund manager Neuberger Berman. Fuld, 62, blundered by not getting out of mortgage securities fast enough after the U.S. housing market began to crumble last year, said Richard Bove, an analyst at Ladenburg Thalmann & Co. Fuld also moved too slowly to bring in a capital infusion from outside investors, Bove said. "The opportunity has been there, but the lack of willingness to deal on Fuld's part has been huge," Bove said. Once the biggest U.S. underwriter of mortgage-backed securities, Lehman was stuck with the assets after two Bear Stearns Cos. hedge funds that invested in the instruments collapsed in July 2007, causing the market to freeze. The ensuing credit contraction ultimately led to the takeover of Bear Stearns, once the fifth-biggest U.S. securities firm, by JPMorgan Chase & Co. in March for $10 a share in a deal backed by the U.S. Federal Reserve. Banks and brokerages, scrambling to reduce costs as revenue dried up, have cut more than 110,000 jobs. 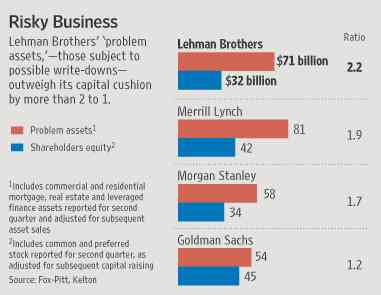 Lehman had about $65 billion in mortgage-related assets at the end of the second quarter. Most of the portfolio, about $40 billion, was tied to commercial real estate holdings, which Lehman may spin off into a new company dubbed "Spinco," people familiar with the matter said before today's announcement. Standard & Poor's said yesterday it may lower its A1 long- term rating on Lehman because the "precipitous decline" in the share price creates uncertainty about the firm's ability to raise additional capital. S&P said Lehman's liquidity is "sound," noting the firm has the ability to borrow from the Federal Reserve. Founded in 1850 by three Jewish immigrants from Germany, Lehman has managed to avert previous potential disasters and is now among the handful of U.S. financial firms that have endured for more than a century. Lehman has been on the verge of collapse at least four times: in 1929, when the stock market crashed; in 1973, when the firm lost $6.7 million betting on interest rates; in 1984, when internal dissension led to a takeover by American Express Co.; and in 1994, when newly independent Lehman faced a capital shortage. Lehman's second-quarter loss of $2.8 billion was its first as a publicly traded company. "I hope Lehman doesn't succumb this time either because we're running out of investment banks," said Sean Egan, president of Egan-Jones Ratings Co. "And it takes 100 years to create a good one." Fuld attempted to shore up Lehman last quarter by raising $14 billion of capital, selling $147 billion of assets, increasing cash holdings and reducing its reliance on short-term funding to create a buffer against a possible bank run. He replaced his second-in-command, Joseph Gregory, with Bart McDade, a 49-year-old known within the firm for his cautious approach to risk taking. Lehman: Too big to fail? Lehman Brothers has finally announced a path to raising capital. But after Tuesday's 45% plunge in its stock price, it's unclear if Wall Street will let chief executive officer Richard Fuld carry out the plan. Lehman's stock was down about 2% late Wednesday morning after the company said it would slash its dividend, look for a buyer of the majority of its Neuberger Berman investment management unit and spin off part of its commercial real estate business. Shares are trading at their lowest point in 10 years, having plummeted nearly 90% so far this year. And by the way, the company lost $3.9 billion in the third quarter. So now, the natural question that needs to be asked is this: On the heels of the Treasury Department's takeover of mortgage giants Fannie Mae and Freddie Mac, does the government now have to step in and bailout Lehman as well. Unfortunately, it may have no choice. The Federal Reserve set a dangerous precedent in March when it helped engineer the takeover of Bear Stearns by JPMorgan Chase by agreeing to guarantee $29 billion in potential losses. Since then, several Fed members, most notably chief Ben Bernanke, have gone out of their way to defend the action, arguing that Bear Stearns simply was too big to fail. The repercussions of allowing Bear to collapse could have been catastrophic. So if Bear was determined to be too big to fail, isn't it likely the Fed would think Lehman is as well? Probably. That's because Lehman, the fourth-largest investment bank, is bigger than Bear, which was the fifth-largest at the time it nearly imploded. What's more, Lehman, a bond-trading powerhouse, is even a bigger player in the mortgage-backed securities market than Bear was. So the Fed could easily argue that letting Lehman go under could create even more chaos in the already volatile credit markets. Yes, Fuld wants to keep the bank independent by taking a piecemeal approach to breaking up the company. But the market may not let him do so. And until Lehman actually announces that it has, in fact, raised a substantial amount of capital, it's likely that there will be continued pressure on the stock. If Lehman's stock falls further, it's reasonable to think that some financial institution would take a gamble on buying the company, especially if it could get Lehman through a "takeunder" just as JPMorgan did with Bear. Some analysts have tossed out investment manager BlackRock, British bank HSBC and private equity firm Blackstone as potential bidders. But why would any of them agree to take on all the risk without some assurance from the Fed? After all, that's exactly what JPMorgan got in the Bear deal. Don't get me wrong. I don't like the notion of big Wall Street firms getting saved after making irresponsible, reckless decisions. In what's supposed to be a free market, companies should be allowed to fail. But the Fed has already opened Pandora's box. It's too late now to say that Lehman should be left to wither away to nothing while Bear was allowed to escape that fate. To be sure, if one of the three aforementioned firms were to try and buy Lehman and wanted the Fed's help, this would be more complicated than the JPMorgan takeover. BlackRock and Blackstone aren't banks. And HSBC is not a U.S.-headquartered institution. Still, Bernanke and Fed vice chairman Tim Geithner have demonstrated a remarkable willingness to be flexible and creative in dealing with the credit crunch. So if they wanted to help someone buy Lehman, one would think they would find a way to get it done. Like it or not, the age of the bailout is in full swing. Lehman Brothers Holdings Inc. came under mounting pressure Tuesday after hopes faded for an investment deal with a Korean bank, helping to trigger a 45% fall in the firm's shares. Lehman's troubles mark the latest installment in the worst financial-system crunch in decades, coming just two days after the U.S. government announced its plan to take over the two giants of the mortgage business. U.S. stocks fell Tuesday, giving back gains that had greeted the weekend bailout of Fannie Mae and Freddie Mac. The drop in Lehman shares highlights the continuing nervousness in markets as the company attempts to raise fresh capital to offset sharp declines in the value of its assets. Shares of Lehman, which is heavily exposed to troubled real-estate investments, have been under pressure for months and were down about 80% this year before Tuesday's drop. Investors have been frustrated as Lehman has taken months to pull together a plan to raise capital to absorb expected losses. On Tuesday, credit-rating services Standard & Poor's and Fitch Ratings placed their ratings on Lehman on review for downgrades. S&P cited uncertainty about the firm's ability to raise capital, "based on the precipitous decline in its share price in previous days." If downgraded, Lehman may be required to post billions of dollars in collateral to its trading partners on derivative contracts and other agreements. In an attempt to assuage investors, Lehman said late Tuesday that before markets open Wednesday, it will offer a preview of its third-quarter earnings and announce "key strategic initiatives." The people familiar with the firm said Lehman plans to announce it is in talks with money manager BlackRock Inc. to sell a package of primarily British residential real-estate assets. Also, Lehman is expected to announce a separate plan to spin off some commercial real-estate assets into a new company, referred to internally at Lehman as SpinCo. The remaining portion of the firm, shorn of much of its distressed real-estate assets, is being called CleanCo, these people say. Lehman has been shopping for investors to buy a piece of its investment-management unit, which includes the profitable asset-manager Neuberger Berman. Three private-equity firms are in the running for this division, with bids due late Friday night. People familiar with the company say this piece could bring in about $5 billion. The 158-year-old financial firm was trading normally with counterparties on Tuesday. Rival Wall Street firm Goldman Sachs Group Inc. said it was doing business with the firm. Lehman, one of four big independent firms remaining after the near collapse of Bear Stearns Cos. in March, declined to comment. The firm's situation differs markedly from that of Bear Stearns, which was taken over earlier this year after it ran into a liquidity crisis. Unlike Bear Stearns, Lehman has access to new Federal Reserve facilities that can provide short-term funding when the markets won't, in addition to the ability to exchange illiquid assets for safer securities such as Treasurys. That makes a sudden run on an investment bank less likely than it was a few months ago. The facilities for dealers weren't in place when Bear Stearns faced its crisis. The Fed does not disclose which institutions are using these facilities. Lehman's declines came after the Korea Development Bank, which has been in talks with Lehman about a capital infusion, said Tuesday it had closed the door on a possible deal. Discussions between Lehman and KDB ended in early August, according to a person familiar with the talks. KDB said Wednesday it has ended talks with the investment bank "due to differences in transaction terms with Lehman and in consideration of the domestic and international financial market situation." It didn't elaborate. But persistent rumors that a deal was still possible continued to bolster the firm's stock. The share decline helped drag down the rest of the market, which had rallied strongly on Monday after the bailout of Fannie and Freddie. Financial stocks tumbled more than 6%, including a 10% decline for Lehman rival Merrill Lynch & Co. and a 14% drop for Wachovia Corp., which is also struggling under the weight of bad mortgage loans. By 4 p.m. Tuesday, the Dow Jones Industrial Average had shed 280 points, nearly wiping out the 289-point gain from Monday's session. Lehman shares last swapped hands at $7.79 each, their lowest level in 10 years. The severe stock drop showed how skittish investors remain about Lehman, a bond-focused firm that moved aggressively into the commercial real-estate market and leveraged loans over the past few years, and often produced record profits between 2004 and 2007. As the value of those investments has unraveled, Lehman has scrambled to raise capital to absorb the ensuing losses. Lehman's market capitalization stood Tuesday at $6 billion, down from $37.2 billion at the start of 2008. It has lost $4 billion in market capitalization in the past two days alone. "It is a chicken-and-egg issue," said Tanya Azarchs, an analyst at S&P. When Lehman looks as if it's having trouble raising capital, shares fall. When shares fall, raising capital by selling shares gets harder. "Regardless of whether the rumor is true or not, in a way it becomes self-fulfilling." Markets expect that continued losses on residential and commercial mortgage securities will force Lehman to seek still more capital than the $12 billion it has raised already this year. The firm's capital, or its shareholders equity -- about $32 billion -- is the cushion that protects creditors from any losses on its roughly $640 billion in assets. Analysts are predicting the firm will lose as much as $4.6 billion and faces several billion dollars in write-downs on its real-estate portfolio. Bonds issued by Lehman also lost value Tuesday, pushing some of their interest yields to more than eight percentage points above those of comparable Treasury securities. Debt investors "are understandably worried that the Federal Reserve and the Treasury Department don't have an unlimited appetite for bailout transactions," Kathleen Shanley, an analyst at Gimme Credit, said in a note on Tuesday afternoon. In the market for credit-default swaps, where traders buy and sell private contracts that act like insurance against debt defaults, the annual cost of protecting $10 million of Lehman debt from default over five years jumped to $520,000 on Tuesday afternoon, versus $325,000 on Monday, according to data from Phoenix Partners Group. The higher cost indicates investors see a growing risk that the firm could default on its obligations. In March, the cost of protection on Lehman's debt briefly hit a high of $580,000. Contracts on Bear Stearns's debt had peaked at around $820,000 before the investment bank was taken over by J.P. Morgan Chase & Co. Lehman's preferred shares also tumbled to new lows, a development that could hamper the company's ability to raise additional capital by issuing more of these hybrid stock-debt securities. One issue -- Lehman Series J preferred shares -- fell more than 24% on Tuesday to $9.15, down from their issuance price of around $25. Lehman pays a fixed annual dividend of 7.95% on these shares, and their current prices reflect a yield of 16.6%, according to PreferredsOnline, a database for U.S. preferred securities. That means that to attract outside investors to new preferred shares, Lehman would have to pay prohibitively expensive annual rates of 16% or more. S&P, in placing its single-A rating on Lehman on review for a downgrade, said it might end up affirming the ratings but could also downgrade them by more than one notch. Lehman's short-term credit ratings could also be cut, which could affect its ability to tap money-market funds for cash in the short-term debt and overnight repurchase agreement markets. Adding to the turmoil: The firm, which has 24,000 employees, cut 1,000 to 1,500 jobs Tuesday, its fourth round of layoffs this year. As employees cleared out their desks, colleagues stayed glued to television screens, watching Lehman's share decline. Outside the company's headquarters in midtown Manhattan, one employee, who declined to be named, said: "The market is biased against us." Over the weekend, Lehman executives grew heartened by the government's rescue of Fannie and Freddie. They expected the plan to soothe the markets, particularly the battered financial sector. Investors appeared agitated about Lehman, however, which for months has been loath to provide details about how it would find new capital. By failing to announce a solution before now, Lehman has backed itself into a corner. In theory, the steep drop in its market value should make Lehman a more attractive takeover target. A more likely scenario may be for Lehman to continue to muddle through, using access to the Fed's discount window to fulfill its counterparty obligations. "Clearly the company does not believe that it has a serious balance-sheet problem and it simply refuses to take what it believes are fire-sale prices for its key assets," Richard Bove of Ladenburg Thalmann & Co. said before Tuesday's stock drop. "Buyers seem to believe that Lehman is overvaluing its assets and refuse to hit the bid." Should the Fed Bail Out Lehman? Can It? Is it time for the government to help out Lehman Brothers Holdings? It has been all of two days since the Fannie Mae-Freddie Mac bailout was announced, the Dow Jones Industrial Average fell 280 points and a general sense of doom hangs over the markets. And yet, Lehman is the center of an anxiety show all of its own. Its shares fell 45% on news that Korea Development Bank wasn’t interested in a deal. Then there are the three fears: coming third-quarter earnings, expected to be horrid; its exposure to risky real estate and mortgages, a market already plagued with uncertainty amid the government intervention at Fannie Mae and Freddie Mac; and the threat that worried counterparties might avoid doing business with Lehman in a replay of what happened to Bear Stearns. When it comes to broker-dealers like Lehman, federal regulators have only a hammer, a plumb line and a wrench. They can force a shotgun marriage, arrange a line of credit or put their authority–often referred to as “moral suasion”–behind an industry-led bailout of Lehman. Deal Journal took a look at their options. Line of credit: The Fed discount window still is open for Lehman, so unless things really are dire the Fed probably won’t be called upon to further boost the company’s access to funding. Remember, the Fed offered a $30 billion line of credit to Bear Stearns, and this summer the Treasury extended a line of credit to Fannie Mae and Freddie Mac. Shotgun marriage: This is a tried-and-true method of federal intervention that keeps the pressure off the government. The technique has more of a history among deposit institutions–which are heavily regulated–than investment banks like Lehman. Still, examples abound. One banking lawyer recalled how Riggs Bank, facing a money-laundering investigation, was nudged into a deal with PNC Financial in 2005 after the two banks had blown two other attempts to merge. This April, Fremont General sold its deposits and bank branches to Capital Source weeks after regulators ordered Fremont to raise capital or put itself up for sale. The problem with this option for Lehman is the paucity of potential partners to whom the Fed or Treasury could make an appeal. Saddling another bank with Lehman’s mortgage-backed securities wouldn’t exactly be the definition of a bailout. Moral suasion: The Fed is a guardian of the U.S. economy. Moral suasion is the term for the Fed’s ability to intervene so that the company to be saved isn’t embarrassed by an official Fed censure. The best example is the bailout of Long-Term Capital Management, in which the Fed called 13 banks to the table and asked them to work out a solution themselves. Another was the bailout of Chrysler, in which low-cost funding was provided by the government, with the Fed and Treasury sitting on the “stabilization committee” overseeing the process. In the 1970 case of Penn Central, the Fed didn’t impose a bailout but said it would be available to help businesses access the then-constricted market for short-term commercial paper. In New York City’s fiscal crisis in the 1970s, the Fed was the fiscal agent. Of course, the Fed isn’t a bottomless pit of resources, and it has lavished a considerable chunk of its own balance sheet on asset acquisitions and bailouts this year, to the tune of at least $200 billion. Paul Volcker fretted about the Fed’s funding in May when the Fed still had about $800 billion in Treasury securities on its balance sheet to save the markets. It has considerably less room now. Treasury, as well, has its balance sheet occupied with Fannie Mae and Freddie Mac. Bailing out Lehman is one thing; if that were to then lead to a bailout of the regulators themselves, that would be quite another. Credit ratings agency Standard & Poor's Ratings Services on Tuesday lowered its outlook on Washington Mutual Inc., a day after its chief executive was removed amid a troubled banking environment. S&P lowered the outlook to "Negative" from "Stable." "The outlook revision reflects the increasingly challenging housing and mortgage markets and their impact on WaMu's core mortgage franchise," said Standard & Poor's credit analyst Victoria Wagner in a statement. It affirmed the 'BBB-' long-term and 'A-3' short-term counterparty credit ratings on WaMu and the 'BBB' long-term and 'A-2' short-term counterparty credit ratings on Washington Mutual Bank. A "BBB" rating is the second-lowest investment grade rating and a "BBB-" rating is one notch below that, the lowest rating before "junk bond" status. An "A-3" rating indicates adequate protection parameters for short-term obligations, it is the third-highest short-term issue credit rating and one notch below "A-2." The lowered outlook also comes a day after WaMu said it entered into a memorandum of understanding with the Office of Thrift Supervision, its primary regulator. The Seattle bank committed to provide the OTS with an updated, multiyear business plan and forecast for its earnings, asset quality, capital and business segment performance. The plan will not require the company to raise capital or increase liquidity, WaMu said. The memorandum "highlights the challenging operating environment the company faces in managing its core mortgage franchise," S&P said. Shares fell 6 cents to $3.24 during aftermarket electronic trading after closing at $3.30. Washington Mutual Inc. Chief Executive Officer Alan Fishman, who sold the last bank he ran, may not be able to repeat the feat because new accounting rules for devalued loans are driving away buyers. At least three potential acquirers ended talks this year to buy either Seattle-based WaMu or Cleveland's National City Corp., according to two bankers involved in the talks. A sticking point, they say: a rule change that will force acquirers to compute a target's assets at market prices instead of deriving values from measures including the purchase price. The Financial Accounting Standards Board's change, effective in December, may delay consolidation in an industry saddled with more than $500 billion in writedowns and credit losses. Loan prices may drop by about 30 percent from their valuation at maturity, said Robert Willens, a former Lehman Brothers Holdings Inc. accounting analyst and executive who teaches at Columbia Business School. "The new rule will curtail M&A by making it too expensive," said Willens, who also runs a tax consulting firm in New York. "With loans fetching their greatest discounts since the Great Depression, it sharply reduces the value of a target's assets. That will force an acquirer to raise additional capital in this very difficult environment." Brad Russell, a spokesman for Washington Mutual, declined to comment on potential acquirers and the FASB rule, as did Kelly Wagner Amen at National City. The new rule isn't the only obstacle to bank mergers. Plunging home prices and rising defaults have punctured mortgage securities, forcing lenders to conserve cash. U.S. markets remain "volatile and fragile," and bankers are reluctant to lend because of increased risk, Deutsche Bank AG Chief Executive Officer Josef Ackermann said at a Sept. 5 conference in Canada. Fishman, for that matter, said in an interview yesterday a sale isn't in the bank's future. "You don't build a company to sell it," the 62-year-old lifelong New Yorker said in a Sept. 8 interview. Fishman, who replaced ousted predecessor Kerry Killinger, 59, was CEO of Brooklyn's Independence Community Bank Corp., which was sold to Sovereign Bancorp in 2006. Others aren't so sure. "The market will likely view the removal of WaMu's former CEO as the last remaining hurdle for the board to consider pursuing a possible sale," Merrill Lynch & Co. analyst Kenneth Bruce wrote in a note to investors yesterday. Complicating a potential sale: "the poor quality of WaMu's loan portfolio." WaMu shares plunged 20 percent yesterday to $3.30, bringing their losses so far this year to 76 percent. Shares of National City, down 71 percent so far this year, fell 8 percent yesterday to $4.76. The banks are the two worst-performing members of the 24-company KBW Bank Index so far this year. Loans are hard to ignore. The $4.6 trillion of loans held by the 24 companies in the KBW Bank Index make up half their assets, data compiled by Bloomberg show. At WaMu, the nation's biggest savings and loan, the percentage is even higher: $240 billion of loans are 77 percent of assets. It's much the same at National City, where $113 billion of loans are 74 percent of assets, according to data compiled by Bloomberg. Banks are in "capital preservation mode," said Andrew Marquardt, an analyst at Fox-Pitt Kelton Cochran Caronia Waller, who rates National City "in-line" and doesn't cover WaMu. FASB, which sets U.S. accounting rules from its headquarters in Norwalk, Connecticut, says the new rule will bring U.S. standards in line with those overseas. The board first decided on its implementation last December, giving companies a year to incorporate the new standard into accounting procedures. One opponent was the American Bankers Association in Washington, whose members represent more than 95 percent of the banking industry's $13.3 trillion in assets. "In today's environment I think it will discourage mergers and acquisitions," said Donna Fisher, the ABA's director of tax and accounting. Investors have mostly been supportive because the rule promised enhanced disclosure, said Sue Bielstein, a FASB director. "We had calls broadly for common standards in this area because it caused significant headaches," Bielstein said. "An element of the international standards leapfrogged ours and that's where we were playing catch-up." Wachovia Corp. shares dropped Tuesday as a downgrade from Merrill Lynch weighed on the stock, even after the bank reiterated that it is on track to reduce its exposure to troubled securities and loans by $20 billion this year. Shares tumbled $2.75, or 14.5 percent, to $16.24. Shares have lost more than half their value this year. Earlier Tuesday, Merrill Lynch & Co. downgraded Wachovia's shares to "Underperform" and cut its target price on the stock by $2 to $16. According to presentation materials from a Lehman Brothers Holdings Inc. conference, Wachovia is on track to reduce securities and outstanding loans on its balance sheet by $20 billion this year, which will free up $1.5 billion in capital. Additionally, Wachovia still expects to reduce expenses by $2 billion by the end of 2009. However, the second-half expense benefit will be more than offset by $525 million to $650 million in severance and benefit costs related to previously announced job cuts, Wachovia said. Following the presentation, Deutsche Bank analyst Mike Mayo cut his third-quarter estimate to a loss of 10 cents per share from a profit of 11 cents per share. "The main positive from the presentation was that there was not a major negative surprise," wrote Mayo in a note to clients. "Losses in option ARM loans are still within prior expected ranges. The company is moving ahead on its expense program and will review all options, including modest asset sales." Late Monday, the bank named former Carlyle Group executive David K. Zwiener as its chief financial officer to succeed Thomas Wurtz, who announced his departure in July. "We think the new CFO has his work cut out, and we expect rising credit losses over the next few quarters as the new management team assesses Wachovia's balance sheet exposure," wrote Morgan Keegan & Co. analyst Robert Patten in a note to clients Tuesday. "Downside risk to earnings estimates and potential erosion of tangible book value remain significant." Patten reiterated an "Underperform" rating on the shares. Sandler O'Neill & Partners analyst Kevin Fitzsimmons, meanwhile, maintained a "Hold" rating on the shares, noting that the management change brings a fresh set of eyes to the problems the bank faces. "Interestingly, the choice of CFO was not necessarily an individual with experience running a retail/commercial bank, but an individual with more of a broad-base of financial services experience, likely to help the CEO work through the complex challenges currently facing the company," Fitzsimmons wrote in a note to clients. Zwiener's hire is the latest executive move among a string of shake-ups at the Charlotte, N.C.-based bank. Struggling with escalating losses tied to bad mortgage debt, Wachovia ousted Chief Executive Ken Thompson earlier this summer, and brought in Robert K. Steel, a former Treasury Department official, as his replacement. Last month, the bank said it planned to cut 600 more jobs than previously expected, for a total of 11,350 eliminated positions. Wachovia also revised its second-quarter loss lower to $9.11 billion from $8.86 billion, due to an increase in its legal reserves. Citigroup Inc. has taken a $450 million pretax hit so far this quarter due to its exposure to the troubled mortgage finance companies Fannie Mae and Freddie Mac. In a filing Wednesday with the Securities and Exchange Commission, Citigroup said its total exposure to preferred shares of Fannie and Freddie is now about $50 million, down from about $1 billion on June 30, 2008. That exposure has been reduced through sales, hedges and write-downs, Citigroup said, and the quarter-to-date pretax impact on revenues from trading losses and write-downs has been about $450 million. However, the final impact to third-quarter results could change before the quarter ends on Sept. 30, Citigroup said. Citigroup _ the nation's largest bank by assets _ has posted losses for the past three quarters due to its heavy investment in assets tied to mortgages and other souring debt. Analysts surveyed by Thomson Financial are split over whether the bank can turn a profit for the third quarter, but on average, they anticipate a profit of 3 cents per share. The yen rose against the euro for a second day and advanced versus the dollar on speculation credit- market losses will widen, prompting investors to pare holdings of higher-yielding assets funded with Japan's currency. The yen also traded near a two-year high against the Australian and New Zealand dollars, two favorites of so-called carry trades, amid concern the U.S. government's takeover of mortgage lenders Fannie Mae and Freddie Mac won't halt subprime losses. The U.S. dollar declined versus the euro and the pound. "Investors have second thoughts on whether everything's fine now and if we're are on a steady path of recovery from the credit crunch and the economic slowdown," said Lee Ferridge, a foreign-exchange strategist in London at State Street Global Markets, a unit of the world's largest money manager for institutions. "Skepticism and risk aversion is a central theme. We'll see high-yielders suffer and the yen come back." The yen rose to 152.84 per euro at 10:15 a.m. in London, from 152.96 yesterday in New York. Against the dollar, the yen gained to 107.83 from 108.28. The euro rose to $1.4174 after falling earlier to $1.4047, the lowest since Oct. 9, from $1.4128. The yen may gain to 150 per euro in the coming days, Ferridge forecasts. In a carry trade, investors get funds in a country with low borrowing costs and invest in one with higher interest rates. The risk is that currency market moves erase those profits. Benchmark rates are 0.5 percent in Japan, 7 percent in Australia and 8 percent in New Zealand. Wells Fargo & Co., the biggest bank on the U.S. West Coast, said yesterday it may have to write down most of its $480 million stakes in Fannie Mae and Freddie Mac. Lehman Brothers Holdings Inc. fell almost 13 percent yesterday after analysts at Merrill Lynch & Co. and Oppenheimer & Co. predicted larger writedowns. The pound rose from near a 2 1/2-year low versus the dollar even after the Royal Institution of Chartered Surveyors said U.K. home prices dropped in August as a squeeze on mortgage lending pushed sales to a record low. Britain's currency has fallen 25 of the past 28 days. It was at $1.7619, from $1.7581. The pound fell versus the euro to 80.45 pence from 80.37 pence. Pending sales of previously owned U.S. homes probably fell 1.5 percent in July after rising 5.3 percent in the previous month, according to a Bloomberg News survey of economists before the National Association of Realtors releases the data at 10 a.m. in Washington. U.S. retail sales excluding cars and trucks probably dropped 0.2 percent in August, the first decline since February, according to a separate survey, after a 0.4 percent gain in July. The Commerce Department will release the data on Sept. 12. "You can't say it's all roses for the U.S. dollar," said Hideki Amikura, deputy general manager of foreign exchange at Nomura Trust and Banking Co. Ltd., a unit of Japan's largest brokerage. "There's a very high chance it will continue to fall. The macroeconomic outlook is awful and that won't change anytime soon." The dollar may drop to 107.40 yen today, he said. The euro rose from an 11-month low against the dollar even as a German report showed the nation's trade surplus shrank in July, adding to signs that Europe's largest economy is cooling. "A narrowing in the trade surplus would be negative for growth because exports are not really improving," said Lee Wai Tuck, a currency strategist at Forecast Pte Ltd. in Singapore. The euro may still fall to $1.4050 and 150 yen today, Lee said. Germany's trade surplus narrowed to 13.9 billion euros ($20 billion) in July from 19.7 billion euros in June, the Federal Statistics Office said in Wiesbaden today. The euro is likely to "test" so-called support at $1.3840 against the dollar this week, said Pak Lai Ng, a technical analyst at Forecast Pte in Singapore, citing charts that predict price movements. Support at $1.3840 is a 50 percent retracement of the euro's rise from the November 2005 low of $1.1640 to the all- time high of $1.6038 in July, based on a series of numbers known as the Fibonacci sequence. The support level also lies on an ascending trend line that began in February 2002, Ng said. Royal Bank of Scotland Group Plc cut its forecasts for the euro versus the dollar today. The single currency will end the year at $1.40 before weakening to $1.35 by the end of the first quarter of 2009, it said. The bank's previous predictions were $1.50 and $1.45, respectively. The government's Sept. 7 bailout of mortgage giants Fannie Mae and Freddie Mac will add much-needed liquidity to the secondary market for U.S. mortgages. But it does little to resolve some bigger problems: excessive housing inventories, home prices that continue to drop, and the likelihood of mounting defaults and foreclosures as the economy worsens, say market analysts. The Treasury Dept., by signing contracts with the government-sponsored enterprises (GSEs) under which it agreed to buy $1 billion of what are being called super-preferred shares, effectively wiped out the remaining value in existing common and preferred shares. The deal calls for the suspension of the dividends being paid to preferred and common shareholders in order to conserve cash while the companies are being run by their regulator, the Federal Housing Finance Administration (FHFA). With the GSE rescue now a fait accompli, BusinessWeek decided to update its pre-bailout damage report on Fannie and Freddie to account for the Treasury's announced plan. With roughly $35 billion worth of agency preferred shares in the market, the losses to investors will be substantial. Gerard Cassidy, senior equity analyst at RBC Capital Markets who covers regional banks, expects the banking industry to collectively write down $25 billion to $30 billion on their balance sheets for losses on the preferred shares they are holding. "There's no way these banks are going to carry this stuff for more than the market price past September," he says. Cassidy sees the total losses on the GSE preferreds as very straightforward, roughly 85% of the value on the banks' balance sheets at the end of the June quarter, before the GSEs plummeted in the wake of the Treasury Dept. 's expanded authority to engineer a bailout if necessary. The intervention has resolved any lingering questions about both agencies' senior and subordinated debt, giving them essentially the same guarantee as U.S. Treasury bonds. And Treasury Secretary Henry Paulson promised to provide as much as $200 billion to Fannie and Freddie if necessary to deal with mounting losses due to mortgage defaults. But the bailout does nothing to bolster confidence in the private-label mortgage-backed securities languishing on the balance sheets of Lehman Brothers Holdings and other large investment banks, strategists say. The biggest hit to preferred shareholders is the loss of the dividend, which is the key reason to hold these shares given how little they tend to appreciates, Marilyn Cohen wrote in her newsletter. Tax Advantaged Investor, on Sept. 7. The elimination of the dividend — the primary reason for the plunge in preferred prices — will impair the Tier 1 capital of the regional banks that hold so many of the preferred shares, she wrote. And since many of these banks aren't meeting minimum federal capital guidelines, Cohen said she expects the Federal Deposit Insurance Corp. (FDIC) to seize additional banks that are having difficulty raising the capital needed to stay solvent. Freddie Mac's series Z preferred shares had plummeted to 2.50 on Sept. 9, down 81.6% from their closing price of 13.56 on Sept. 5. It's inevitable that banks and other financial institutions that hold large amounts of GSE preferred shares will have to take substantial writedowns on these assets in the third quarter. There are 12 banks and thrifts that would lose 5% or more of tangible capital were they to take a 100% aftertax, mark-to-market adjustment on their GSE preferreds, according to a Sept. 8 research note by Keefe, Bruyette & Woods. Although only a handful of banks will see a meaningful reduction of their capital levels, the loss of value on the preferreds still takes more than $30 billion out of the banking system, which will mean that much less lending by banks, says Frederick Cannon, a bank analyst at KBW who wasn't one of the authors of the Sept. 8 report. A large, well capitalized bank like Wells Fargo, for example, will have $400 million less in capital because of losses on agency preferreds, but since banks are allowed to leverage their capital by 12 times, that would make nearly $5 billion worth of loans unavailable, he says. It's all but impossible for banks to replace that capital with other sources given the constraints in the capital markets, he adds. To continue to own the GSEs common and preferred shares from now is "essentially an option on Fannie and Freddie emerging from conservatorship as private companies able to create value in excess of a government subsidy," says Cannon. The odds that those shares will ever be worth much are low since the agencies will first have to pay back the Treasury for the value of the government's explicit guarantee, says Cannon. Most observers describe the government's placing the agencies into conservatorship, which is equivalent to a Chapter 11 bankruptcy and entails a reorganization rather than a liquidation of assets, as a step in the right direction for returning some liquidity to the mortgage-backed securities (MBS) market, but by no means a panacea for a much more entrenched housing malaise. The main benefits of the government bailout are that it will tighten the credit spreads between the agency debt and Treasury notes, which should help lower mortgage rates on 30-year fixed loans, making homes more affordable, says Bob Andres, chief market strategist for Portfolio Management Consultants, the investment consultancy arm of New York's Envestnet Asset Management. Given how small a portion of mortgage-backed securities the Treasury has so far promised to buy—$5 billion vs. what could be $750 million to $1 trillion in total outstanding MBS in Andres' estimation—the Treasury intervention will probably boost MBS valuations but won't dramatically reduce mortgage rates, says Andres. On Sept. 9, the second market day after the Treasury's move, the 30-year fixed rates had already fallen to 5.88% from 6.26% four days earlier, according to Bankrate.com. KBW's Cannon says he saw rates on GSE mortgages come down 0.4% to 0.5% on Sept. 7, but with no movement in the nonagency market, says it didn't spill into the broader mortgage market. "So much of the turmoil in the mortgage market is because there's an enormous amount of securities out there for sale [and hardly any buyers]," says Andres. He calls one prediction by an analyst at Moody's Investors Service that mortgage rates could fall as low as 5.5% "overly aggressive." Andres doesn't think the narrowing of credit spreads is a temporary phenomenon, since yields on agency MBS are likely to stay down now that the debt is explicitly guaranteed by the Treasury and since there's a limited chance that Treasury yields will drop as flight-to-quality buying will continue on news of more corporate writeoffs. To the extent that it prevents the Fed from raising interest rates, the slowdown in the global economy could also help bring mortgage rates down, he adds. For all the liquidity that may flow back into the secondary mortgage market, it's not likely banks will feel compelled to start lending again, however. "They've got to rebuild their balance sheets before they lend, and I don't think their balance sheets have finished going down," says Andres. If the government backstop makes more funds available for Fannie and Freddie to buy conforming mortgages from primary lenders, banks could resume lending with greater confidence that they won't have to hold the new mortgages on their own books, says Stuart Hoffman, chief economist of PNC Financial Services Group in Pittsburgh. Banks would still like to provide client services such as home mortgages for customers with good credit histories instead of referring them elsewhere, he adds. Even if banks were to start lending again, there needs to be demand for mortgages in order to get the housing market rolling again, and that's unlikely with unemployment rates going up and more Americans worried about layoffs, says Cassidy at RBC Capital. Since conservatorship is only a short-term solution, it will fall to the next President's Administration to decide on a long-term solution for Fannie and Freddie. Secretary Paulson said the GSEs will be allowed to buy more mortgages until the end of 2009, after which the Treasury plans to sell 10% of their portfolios per year, aiming to eventually trim them down to $250 billion each. But if the housing market hasn't stabilized by 2010 and the new Administration can't agree on a solution, the current program could be extended indefinitely, warns Cassidy. Since the GSEs probably won't emerge as private companies and receivership would be a bad alternative (because the agencies would no longer be able to fulfill their mission), restructuring them seems to be the likely solution, says Cannon. He sees a makeover into entities much like the Federal Home Loan Banks, equity in which is held by 8,100 member banks across the U.S., as the most viable option in the long term for the troubled firms. U.S. senators urged the regulator of Fannie Mae and Freddie Mac to trim or eliminate bonuses for former chief executive officers Daniel Mudd and Richard Syron, ousted when the government seized the mortgage buyers this week. "We find it way out of line that these two executives will be rewarded with millions of dollars in bonus compensation at a time when taxpayer dollars may have to be deployed to cover any financial losses caused by errors in management," Democrats Charles Schumer of New York and Jack Reed of Rhode Island wrote today to James Lockhart, director of the Federal Housing Finance Agency. Mudd and Syron might be paid more than $24 million after the U.S. took over the companies on Sept. 7, the Senate Banking Committee members wrote. Lockhart and Treasury Secretary Henry Paulson tapped Herbert Allison, 65, former CEO of TIAA-CREF, to lead Washington-based Fannie, and David Moffett, 56, a Carlyle Group executive and former vice chairman of U.S. Bancorp, to lead McLean, Virginia-based Freddie. Schumer and Reed urged Lockhart to "quickly review" their pay packages and "substantially reduce or eliminate them" where appropriate. Separately, Senator Richard Durbin, an Illinois Democrat and assistant Democratic leader, today urged Paulson, Lockhart, Allison and Moffett to deny pay deals for Syron and Mudd. "Our focus ought to be on stabilizing the housing market and helping families stay in their homes, not on compensating failed leadership," Durbin wrote. Senator Jim Bunning, a Kentucky Republican, introduced legislation today that would bar former Fannie and Freddie executives and directors from getting severance pay after the government takeover effectively removed them from their jobs. "I don't think we should be lining the pockets of those individuals who were responsible for driving Fannie and Freddie into the ground on the backs of American taxpayers," Bunning, a member of the Senate Banking Committee, said in a statement. Syron, 64, might receive $12 million to $14 million in pay from Freddie Mac and Mudd, 50, may get $7 million to $9 million from Fannie Mae, said David Schmidt, a senior consultant for New York-based compensation firm James F. Reda & Associates, after reviewing employment agreements in company filings. About $8.8 million of Syron's pay is cash in exchange for forfeiting equity grants, he said. FHFA spokeswoman Stefanie Mullin said the agency received the Schumer-Reed letter and she declined to comment. In taking over Fannie Mae and Freddie Mac, Henry M. Paulson Jr. and the U.S. Treasury Dept. cleared up uncertainty surrounding the companies' common stock, preferred shares, and senior and subordinated debt. But Uncle Sam's intervention also triggered a default event, according to the International Swaps & Derivatives Assn., and now roughly $1.4 trillion in outstanding credit-default swaps, a type of derivative contract, must be settled. You remember the credit-default swap (CDS). It began life as an "insurance policy" that big players such as hedge funds took out to hedge investment risks. Over time, however, the CDS became a tool that big funds, financial institutions, and others used as a way to place bets on whether a company would go bankrupt. They're contracts negotiated between two parties and—unlike insurance policies—there's no regulator verifying that companies can actually make good on the $62 trillion of swaps outstanding. Ever since Warren Buffett described derivatives as "financial weapons of mass destruction" in 2003, the market has been waiting for signs that the Oracle of Omaha's vision may come true. That's why the federal government's decision to take over Fannie Mae and Freddie Mac could turn out either to demonstrate that the auction system to unwind such contracts works or to set loose financial Armageddon. In a worst-case scenario, the default swaps could lead to monumental writedowns and overall financial gridlock as companies bicker over prices and unpaid obligations. Still, while Fannie and Freddie sit technically in default, theirs is a default unlike any other. Neither has filed for bankruptcy or stopped doing business. Nor have they missed payments on their bonds. Instead, both companies now have the full—rather than implied—backing of the U.S. Government. In most default cases, the bonds are worth much less than face value. Fannie and Freddie's senior debt is currently trading even, and its subordinated debt is trading at around 97¢ on the dollar. "In most cases, if you bought protection and you go to make your claim, you would expect that the company in default to be trading below par," says CreditSights analyst Richard Hofmann. "Here, it's going to be reverse." That doesn't mean, however, that there won't be problems. First, there are technical issues. An auction system exists to untangle the complex web of transactions that make up the swap market. But to date, it has been tested merely a handful of times, and only by relatively small companies. This process essentially involves a blind auction, where companies enter what they perceive to be the value of the bonds and that information is used to establish a price. The entire process usually takes about a month. No one, however, knows if this auction will work because there's never been a CDS liquidation approaching the size or complexity of Fannie and Freddie. Despite the size of the market for them, relatively few swaps have been subjected to the settlement process. Bankrupt commercial printer Quebecor World was the most recent. The Montreal company had roughly $2 billion in debt outstanding, which was priced at around 41¢ on the dollar; Fannie and Freddie have around $1.6 trillion. The typical failed company has four to eight different bonds; combined, Fannie and Freddie have over 6,000. Nearly 600 CDS holders signed up for the Quebecor World auction; many more should materialize for the great unwinding of Fannie and Freddie. The mechanics of this auction—and whether it will work smoothly—are very much up in the air. "The paperwork that's involved will be huge, and the process has never been tested before," says Ezra Zask, a financial-services expert at consulting firm LECG. "There will be delays and missed specifications." But the dangers extend beyond technical issues. It's unlikely, but sellers of credit default swaps could run into trouble. It's possible that cash-strapped hedge funds have been selling insurance on Fannie and Freddie debt as an easy way to make money—while operating under the assumption they'd never have to pay. But near par isn't the same as par: Even a few pennies below face value could add up to billions of dollars. The hedge funds who wrote insurance might not be able to pay, forcing institutions to write down the value of their swaps. "Hedge funds unfortunately are not insurance companies," says Chris Whalen, a risk analyst at Institutional Risk Analytics. "That's why we're worried." Still, the low-stakes nature of the auction could be a blessing. With so many institutions under stress, it may be only a matter of time before a major bank fails without the government stepping in to back up claims. By then the process will have been tested and a track record established of how financial firms settle up. Then the government can turn to the next task at hand: unwinding the derivatives contracts held by the institution itself, a much more complicated task. The European Commission cut its growth estimate for the euro area this year and predicted a recession for the German economy, the region's largest. The economy of the 15 nations that use the euro will probably expand 1.3 percent this year, the Brussels-based commission said today, revising down its April forecast of 1.7 percent. It signaled the 2009 forecast may also be lowered in a separate report due in November. Europe's economy shrank in the three months through June and Luxembourg's Jean-Claude Juncker, who leads a group of euro- area finance chiefs, today said there is a "risk of a technical recession" as manufacturing and services activity contract and confidence falls. The commission forecast recessions in Germany and Spain, as well as in the U.K., which isn't in the euro area. "Economic activity has slowed down considerably" in recent months, Juncker said in Brussels today. Growth "is expected to stall" in the current quarter, according to the EU report. A technical recession is defined as two consecutive quarters of economic contraction. The euro-area economy may grow 0.1 percent in the fourth quarter after stagnating in the current period, according to the commission. The German economy will probably shrink 0.2 percent in the current quarter after contracting 0.5 percent in the previous three months, and Spain's economy will also contract in the third and fourth quarters, it projected. Outside the euro area, the commission sees U.K. output "contracting slightly" in the second half of the year. "The continuation of the turmoil in the financial markets one year on, the near doubling of energy prices over the same period and the correction in some housing markets have had an impact on the economy," Economic and Monetary Affairs Commissioner Joaquin Almunia said in today's report. While the commission raised its inflation forecast for 2008 to 3.6 percent from 3.1 percent, it said consumer-price growth "may be at a turning point" after oil prices fell from a record and as past increases in food and energy costs "gradually fade in the coming months." The recent fall in commodity prices and the euro also "have provided some relief," Almunia said. Since reaching a record $1.6038 against the dollar on July 15, the currency has dropped around 12 percent. Oil prices have fallen almost 30 percent in the last two months to $103.84 a barrel. The euro slipped 0.1 percent to $1.4120 as of 12:50 p.m. in London. Bonds fell, with the yield on the 10-year bund, Europe's benchmark government security, increasing 2 basis points to 4.06 percent. Still, the euro's advance over the past year and the surge in energy prices have already taken their toll. Paris-based L'Oreal SA, the world's largest cosmetics maker, on Aug. 29 reported the slowest profit growth in three years. Stora Enso Oyj and UPM-Kymmene Oyj, Europe's largest papermakers, today said they will close unprofitable production lines as raw- material and energy costs have outpaced their ability to raise prices. Banks including Amsterdam- and Brussels-based Fortis and Irish Life & Permanent Plc of Ireland have suffered due to writedowns, losses or increased funding costs related to the credit crisis. Credit Agricole SA, France's third-largest bank, today said it will eliminate about 500 jobs at its Calyon corporate- and investment-banking unit to rein in costs following three consecutive quarterly losses. "We expect economic activity to be essentially stagnant across the region in the second half of 2008," said Howard Archer, chief European economist at Global Insight in London. He sees growth slowing to 0.8 percent next year from 1.2 percent this year. The commission said it expects a "marked deceleration" ahead in most Asian economies and predicts that the effect of a tax rebate that boosted second-quarter U.S. growth will fade. The ECB last week lowered its euro-region growth outlook and raised its inflation projections for this year and next. ECB President Jean-Claude Trichet said today in Brussels that inflation "is likely to remain high for quite some time, moderating only gradually during the course of 2009." Some companies have tried to offset falling European and U.S. orders by expanding in Asia and oil-exporting countries. Volkswagen AG, Europe's biggest carmaker, on Sept. 8 said emerging markets will provide the fastest growth in worldwide sales over the next 10 years, led by economic expansion in Asia and Russia. "The deceleration of growth will gain momentum in the second part of the year," Almunia said. "The way the European economies will start" next year "will not be very good." Government officials are letting Wall Street banks pull off what makers of defective cars, computers and condos can't. After the collapse of a product banks created and controlled, they're charging the customers for repairs. The customers include taxpayers from New York to California, as well as not-for-profit institutions such as hospitals and universities. They sold auction-rate bonds, whose interest rates were set in periodic bidding. Since the market for those bonds began to fall apart last year, the issuers have had to pay an extra $2 billion in interest. Now the borrowers are on the hook for possibly billions more in underwriting, legal and other costs for replacing the bonds with less expensive debt, according to data compiled by Bloomberg. Most of the payments are going to the same banks that ran the auctions and are accused by New York Attorney General Andrew Cuomo and states' securities regulators of understating the risks to clients. Investors have been promised $55.3 billion in refunds. Taxpayers aren't getting the same break. "It's sad that taxpayers are paying the costs," said Christopher Taylor, former executive director of the Municipal Securities Rulemaking Board, an industry-controlled group based in Alexandria, Virginia. "If they knew what was going on, they would be indignant." Across the country, public-sector borrowers had $166 billion in auction-rate debt. They have refinanced or made plans to do so for at least $103.7 billion of it, or 62 percent, Bloomberg data show. To exit the securities, New York -- the biggest state issuer of the debt with $4 billion -- has so far spent $138.4 million. That's equal to the annual salaries and benefits for 900 state jobs being eliminated because of a budget crisis, plus the cost of preschool education for 20,000 children. Including the initial costs of selling auction-rate bonds and higher-than-expected interest, the state's total extra expenses will climb to at least $340 million, according to state data compiled by Bloomberg. The state sells bonds to fund prisons, roads, mental-health facilities and economic development projects. Ultimately, the government and nonprofit borrowers may end up paying Wall Street billions of dollars in refinancing fees, depending on how issuers replace the debt. If their costs were to match New York's, the tab would exceed $7 billion, not counting higher interest rates. Four of the banks collecting New York's refinancing fees, Citigroup Inc., UBS AG, Merrill Lynch & Co. and Goldman, Sachs & Co., have settled probes into Wall Street's practice of marketing the bonds as equivalent to cash. Those banks and four others, Morgan Stanley, JPMorgan Chase & Co., Wachovia Corp. and Deutsche Bank AG, agreed to pay $522.5 million in fines. They also consented to refund investors stuck with securities they couldn't sell after the banks in February ended a years-old practice of supporting the auctions by bidding for their own accounts. Under the settlements, the bond issuers will be reimbursed "all refinancing fees" for those sold after Aug. 1, 2007, when auctions began failing in the corporate market, and replaced after Feb. 11. That covers about 1 percent of the public-sector borrowings, and none of New York's $4 billion. Alex Detrick, a spokesman for Cuomo, declined to explain the limitation. "It is unrealistic to expect that investment banks, like any other business, would simply provide their services without compensation," State Budget Director Laura Anglin said in an e- mailed statement. As issuers pay the banks to replace their auction-rate bonds, they are also reducing the financial institutions' losses on the securities that state regulators forced them to buy back. New York and others are paying face value for old auction-rate bonds as they are replaced, even though they are worth less. "It sounds like a bailout for the banks," said Michael Granof, a professor of accounting at the University of Texas, Austin. The effect on the banks depends on how the auction-rate bonds are refinanced and how much their value has declined. Jeffrey Rosenberg, a Banc of America Securities LLC analyst in New York, estimated that the $58 billion of remaining municipal auction issues are worth 98 cents on the dollar. That suggests a $1.16 billion loss for banks if they held all the bonds. The costs of replacing the debt are squeezing budgets in a weakening economy. In New York, with a projected deficit next year of $5.4 billion, the collapse of the auction-rate market led to $37.8 million in extra interest from February through July as rates jumped as high as 14.2 percent from about 3.5 percent. New York's costs also include at least $69.7 million of interest payments in future years, above what it expected to pay on the bonds. "The financial burdens are enormous and will be felt in budgets for years to come," said Arthur Levitt, a former chairman of the Securities and Exchange Commission, in a speech Aug. 19 to the National Association of State Treasurers in Rockland, Maine. Issuers are partly to blame, according to Levitt. When bankers presented proposals for auction-rate bonds and associated interest-rate swaps, "skepticism took a back seat to following an investment fad," he said. "As a result, the tough questions were never asked." The collapse of the market for auction-rate bonds put New York state in the same position as millions of homeowners whose adjustable-rate mortgages reset: It wanted to refinance. The state had $4 billion in debt with interest rates, set in periodic auctions, that soared as high as 14.2 percent after bidders vanished in February. That was more than triple the January average. The cost to taxpayers rose even more when the state's first option, replacing auction-rate debt with variable- rate bonds, wasn't available for the full amount. Taxpayers and not-for-profit institutions across the U.S. are on the hook for the same kinds of fees and added interest as New York. The bill for replacing the $166 billion in auction- rate debt may top $7 billion, not counting extra interest, based on New York's expenses. Most of that money is going to the same banks that created and controlled the auction market. "It's unfortunate that borrowing costs will rise at the very time the state plans to increase bond sales and the budget is under stress," said Elizabeth Lynam, deputy research director at the Citizens Budget Commission in New York, a business-funded group that monitors state and city fiscal issues. At the halfway mark in New York's refinancing plan, its costs already exceed $340 million, including higher-than- expected interest rates and fees paid to the banks, according to state data compiled by Bloomberg. To get out of the auction-rate market, which collapsed without warning from bankers, the Division of Budget in Albany cobbled together a patchwork of new fixed and variable-rate bonds and cash prepayments. New York's largest single out-of-pocket cost for exiting auction-rate bonds was $101.1 million. That was to repay borrowings by the state Dormitory Authority, on behalf of the City University of New York, that weren't due until 2014 and 2025. The early repayment, using funds appropriated by the state legislature, soaked up cash New York could have used to provide preschool classes for 32,000 children. The state's $4 billion refinancing plan for auction-rate debt is coming on top of the $6 billion of new bonds it planned to sell this year for projects like roads, schools and state buildings. Auction-rate securities accounted for 8 percent of the state's $49.6 billion of debt on March 31. "It is unfortunate that New York, like states across the nation, needed to adjust its bond portfolio to address this unprecedented disruption in the auction-rate securities market," said Jeffrey Gordon, a spokesman for the division of budget. "Over the long term, this restructuring will provide significant savings and reduce debt costs." The state's "short-term costs were significantly lower" than $340 million, Gordon said. The state so far has replaced about $1.19 billion of auction-rate debt with fixed-rate securities because there weren't enough banks willing to act as buyers of last resort for new variable-rate demand bonds, a cheaper alternative. Lenders offered to support no more than $3 billion of variable debt, an amount "not sufficient to cover our entire need," said Matt Anderson, a spokesman for the Division of Budget. In turning to fixed-rate bonds, the state had to pay to cancel interest-rate swaps while accepting higher rates and shelling out even more in bank fees. The swaps were agreements intended to insulate the state against fluctuations in auction rates. New York would pay a fixed rate to a bank, which in turn would pay the state a floating one pegged to wholesale bank deposits in London. The effect of the exchange was to hold the state's costs for 40 auction-rate debt issues at 3.47 percent. All this blew up when auction rates rose and interest on bank deposits fell, instead of moving in tandem as bankers and borrowers expected. To cancel interest rate swaps as it refinanced, the state paid $37.3 million to six banks -- UBS AG; Lehman Brothers Holdings Inc.; Citigroup Inc.; Merrill Lynch & Co.; Bear Stearns Cos., which is now part of JPMorgan Chase & Co.; and Goldman, Sachs & Co. They arranged the swaps when the auction-rate bonds were first sold, according to the budget department. The biggest swap cancellation fee was $23.5 million on $450.4 million of Empire State Development Corp. auction-rate bonds that were converted to fixed-rate debt. An additional $5 million was for the early repayment of the $101.1 million of Dormitory Authority bonds. About $9 million more was to cancel swaps in the refinancing of a separate $280.8 million of Dormitory Authority debt, also on behalf of CUNY. Bank fees for underwriting new fixed-rate bonds are about six times higher than for variable-rate issues. Goldman Sachs collected $2.2 million for the $450.4 million fixed-rate sale by Empire State Development and just $315,000 for $420 million of new variable-rate demand bonds sold at the same time for the agency. The New York-based bank declined to comment on the difference in the fees. The first auction-rate bonds to be replaced, for $3.45 million in fees, were those issued by the Tobacco Settlement Finance Corp. It was the only state-backed borrower whose debt specified a 15 percent rate if auctions didn't attract buyers. Failed auctions of other issues were pegged to market rates and never exceeded 6.27 percent. Interest costs for other new fixed-rate bonds, which averaged 4.76 percent for Empire State Development and 4.42 percent for the Dormitory Authority, will add $69.7 million to the state's interest bill over the life of the bonds, compared with the costs expected on the auction-rate bonds. The state's $631 million of new variable-rate demand bonds, so named because investors can cash out on a week's notice, also resulted in new costs. Banks collect $368,000 annually for setting new interest rates weekly at levels they expect will attract buyers. A different group of banks is charging $1.31 million this year for agreeing to act as buyers of last resort for the bonds. The cost of those accords, which range from 0.3 percent for one year from Royal Bank of Canada to 0.67 percent for three years from Wachovia Corp., can vary as they are renewed in future years. The risk that bank agreements used for variable-rate bonds could become scarcer and more expensive in the future was one reason for why many issuers sold auction-rate bonds earlier in the decade, said Brian Mayhew, chief financial officer of the Bay Area Toll Authority in San Francisco. The Bush administration took a step Tuesday toward backing up to $50 billion in loans sought by the auto industry on the same day that House Speaker Nancy Pelosi said she'd push for approval of the aid package. The U.S. Department of Energy said it had begun writing the rules for how the money would be lent, a move that makes it more likely that the industry could start borrowing during the next few months, if it can navigate the election-year politics on Capitol Hill and gain the president's full support. Michigan's congressional delegation met twice Tuesday to map a strategy for getting the money through Congress in less than three weeks. Every part of the plan -- the size of the loans, how they could be used and how they would be paid for -- appeared in flux Tuesday, even as the idea received a strong endorsement from House Democrats. The industry was leaning late Tuesday toward paring back its request to the original $25 billion, with an eye toward seeking additional loans in next year's Congress. Industry officials say the toughest challenge likely will be in the Senate, despite the backing of presidential candidates Sens. Barack Obama and John McCain. Pelosi said she would push the House to approve some or all of the $50 billion in loans the auto industry is seeking from the federal government. Pelosi, the top Democrat in the House, said the loans could pass as part of several bills, including an energy package, a second economic stimulus proposal or, as a last resort, attached to the funding bill that will keep the federal government running into the next administration. "This is very, very important to an important industry in our country," Pelosi said Tuesday. "It's about jobs, jobs, jobs." Although $25 billion in loans to automakers for retooling costs was approved as part of last year's energy bill, automakers, suppliers and the UAW have sought $50 billion in recent months as the best chance to help the industry survive one of its toughest periods, squeezed by high energy prices, soaring costs for new technology and sickly balance sheets at Detroit automakers. Automakers have suggested making $50 billion available over three years, with $25 billion in the first year, $15 billion in the second and $10 billion in the third. Companies would pay an interest rate close to 5%, rather than rates approaching 20% that commercial lenders would charge. The full $50 billion would cost the government $7.5 billion to launch. The Bush administration has said it was considering the auto industry's request, but it has not taken a position on it. Under last year's bill, the Department of Energy was required to write the rules for handing out the funds, even though Congress put no money into the program. U.S. Rep. John Dingell, D-Dearborn, wrote Energy Secretary Samuel Bodman last month urging him to finish the rules by the end of the year so that the industry could begin receiving the money early next year. Energy spokeswoman Healy Baumgardner said Tuesday that the administration had begun writing the rules but declined to say whether the agency planned to complete the task before year's end. House Majority Leader Steny Hoyer, D-Md., said the plan had some bipartisan support, though so far most of its GOP support is from the Michigan delegation. "I'm cautiously optimistic something will happen this month," said Rep. Candice Miller, R-Harrison Township. In the Senate, the prospects appear less certain. While Senate Democrats have proposed funding for up to $6 billion in loans for automakers and suppliers, the Senate blocked the funds for the original $25 billion. Senate members have far more power to stop bills they oppose, and figuring out how to pay for the government's cost in the loans could easily get snared in larger debates over taxes. "We're still working on the strategy of how that's going to come forward," said Michigan Sen. Debbie Stabenow. "It's certainly the quickest way to get the leap-ahead technology. Call it a Washington pile-on. A normal taxpayer might think that since the Treasury Department has just committed the government to spending an unknown (but possibly very large) amount taking over Fannie Mae and Freddie Mac, Congress would be in a tightfisted mood. But that's not the way some Washington lobbyists and politicians think. Instead, they're viewing the bailout as an invitation to push through other taxpayer-financed bailouts and aid in the few weeks that Congress will work before members break to campaign full time for the November elections. "We're talking about the next New Deal," enthuses William McNary, president of USAction, a national coalition of grass-roots community organizers. He wants more money from Congress for everything from food stamps to inspecting and fixing bridges and roads. U.S. automakers General Motors, Ford Motor and Chrysler, for their part, are pushing Congress to appropriate by the end of this month $3.75 billion of $25 billion in loans authorized last December to help the money-bleeding companies overhaul their plants so they can build more fuel-efficient vehicles. They want another $25 billion in low-cost loans authorized for when they've run through the first $25 billion. Pete Davis, president of Davis Capital Investment Ideas, predicts the government's budget wonks will estimate that the added $25 billion loan package will cost taxpayers $900 million. Hey, that's less than $1 billion. Plus, it will play well politically in Michigan, where more than 260,000 manufacturing jobs have been lost since 2000, and in Detroit, where one in every 10 workers is without a job. Meanwhile, Democrats in Congress are itching to pass a second economic stimulus package to benefit American consumers before they make their way to the ballot box--except that it won't go directly into Americans' bank accounts this time around, as it did with the tax rebates in round one. Reports say the measure, not written yet, will total $50 billion in the form of grants to help state and local governments with infrastructure projects, Medicaid costs and local law enforcement, as well as relief for Gulf Coast residents struggling with flood costs and those in the Northeast and upper Midwest straining to pay winter heating bills. Politics plays a part in this of course. "I got a four-letter word: j-o-b-s," said U.S. Rep. Rahm Emanuel, D-Ill. "That's the focus of the second stimulus. We want to own the issue that we are the party of a jobs agenda. We will take it up as soon as we are done with the energy bill." But the demand for more infrastructure spending isn't coming from just Democrats. Desmond Lachmann, a resident fellow from the conservative American Enterprise Institute, has advocated it too. Also with her hand out is Bush administration Transportation Secretary Mary Peters, who told Congress last week she wants it to inject $8 billion into the federal Highway Trust Fund. The trust's main source of funding is the flat, 18.4-cents-per-gallon gas tax. The rising price of gas has led Americans to drive tens of billions of miles less this year--meaning less money going into the trust fund. All this is in addition to the $70 billion to $100 billion that Congress is expected to pass in supplemental funding for the wars in Iraq and Afghanistan. Then, of course, there's the Fannie and Freddie rescue. The Congressional Budget Office estimates the bailout could cost taxpayers $25 billion in the long run. But rescuing the mortgage giants--which together have roughly $6 trillion in liabilities--might also cost zilch. Or, if the housing market worsens, the bill could be much bigger. William Poole, former president of the Federal Reserve Bank of St. Louis, calculates that should Fannie's and Freddie's loan books suffer 5% losses, the bailout would cost the taxpayers about $300 billion. European companies may be living on borrowed time. A decade of investing more than they've earned in profits has loaded corporations in the 15-nation euro area with debt, leaving them a thinner cushion than their U.S. and Japanese counterparts as the world economy slumps. Companies including France's Renault SA and Thomson SA are under pressure to curtail hiring and capital spending to meet rising interest payments as weaker growth squeezes their profits. That increases the threat of a prolonged slowdown for the euro-area economy, which contracted in the second quarter for the first time since the single currency began trading in 1999. Economists at Deutsche Bank AG predict investment will shrink in 2009 for the first time in seven years, leaving the economy to grow just 0.1 percent for the year while the U.S. expands 1 percent. "The size of the debt imbalances makes it very difficult to envisage a strong euro-zone economy over the next year or so," says David Owen, chief economist at Dresdner Kleinwort Group Ltd. in London. "It increases the risk of recession." For Europe's non-financial corporations, the gap between profits and investment rose to 4.5 percent of annual output last year, compared with 3.6 percent for their counterparts in the U.S., Citigroup Inc. estimates. Exclude companies in Germany, where earnings still outstrip investment, and the gap swells to 6.6 percent. The result: Europe's non-financial companies are burdened with 5.3 trillion euros ($7.6 trillion) of debt, equal to about 57 percent of the euro-zone economy. That's up from 48 percent before the 2001 slowdown and compares with 46 percent in the U.S., according to data from the Federal Reserve and the European Central Bank. U.S. companies such as San Jose, California-based network- equipment maker Cisco Systems Inc. entered the slowdown with more than half a trillion dollars in cash they accumulated earlier in the decade by reducing debt, controlling spending and keeping inventories in check. That means they are under less pressure now to cut payrolls and investment. Japanese firms may be even healthier after ridding themselves of idle factories and excess workers. Robot-maker Fanuc Ltd. amassed $5 billion in cash this decade after paying off $8 billion in long-term debt between 1995 and 1999. Mizuho Research Institute Ltd. forecasts corporate spending will help Japan's economy, which shrank in the last quarter, rebound faster than Europe's or America's. European companies, on the other hand, took advantage of cheap credit to increase borrowing, allowing them to make acquisitions and boost investment for 20 straight quarters. French drugmaker Sanofi-Aventis SA, for example, took out a 16 billion-euro loan in 2004 to pay for the merger that formed the company. Corporations in all sectors accelerated their borrowing in 2005-2007, adding 1.8 trillion euros to their debt, mostly in bank loans, according to Mark Wall, an economist with Deutsche Bank in London. Now, he says, those companies are "under attack from both sides" as they attempt to manage their financing costs. Their profit margins are squeezed by slowing demand, record fuel costs and rising wages. At the same time, banks, trying to rebuild their own balance sheets, are tightening standards and demanding higher interest rates to make new loans or refinance current ones. The cost of borrowing in euros for three months -- a benchmark that determines the rate on bank loans such as Sanofi- Aventis's -- has jumped about 66 basis points, or 0.66 percentage point, since the beginning of August 2007 and stands near the highest level since December 2000. Banks told the ECB this quarter that they expect to tighten lending standards further. Germany has already been down the path that economists foresee elsewhere in Europe. Having sunk money into the technology bubble of the 1990s, German companies were forced to slash spending in the 2001-2004 period as growth slowed, leaving Europe's largest economy lagging behind the subsequent recovery elsewhere in the euro region. That means German companies are less burdened with debt now and less in need of curtailing their borrowing, says Jacques Cailloux, an economist at Royal Bank of Scotland Group Plc in London. "Germany is bucking the trend," he says. This time, Spain's companies are the most in hock after their debt doubled since 2000 to 129 percent of the country's GDP amid a housing boom, according to Standard & Poor's. In the bust that followed, property developer Martinsa- Fadesa SA became Europe's largest bankruptcy in five years in July when it defaulted on 5.2 billion euros of debt. Its biggest rival, Metrovacesa SA, said last month it will increase asset sales to reduce the 7.5 billion euros it owes. One sign of growing concern about the ability of companies to handle their debt: So far this year, Moody's Investors Service has cut long-term credit ratings on 216 European companies, including Hanover, Germany-based tiremaker Continental AG and vodka producer Belvedere SA, in Beaune, France, while raising grades on just 81. In the same period last year, it lowered 237 and increased 497. Belvedere obtained protection from creditors in July. Harsher terms for companies that are restructuring what they owe may lead to a quadrupling of defaults on high-risk loans in Europe to 5.8 percent by June 2009 from 1.55 percent in the same month this year, S&P said last week. In August, S&P cut the credit rating for Thomson, the world's largest provider of television set-top boxes, by one grade to B+, partly because the company's 1.3 billion-euro debt left it with "high leverage" after its biggest half-year loss since 2005, S&P said. Thomson is seeking to reduce expenses by 50 million euros this year. Other businesses are retrenching as well: Capital spending grew at an annual rate of 0.8 percent in the first half of this year, compared with 4.2 percent in the prior six months, according to JPMorgan Chase & Co. Confidence among manufacturers dropped in August to its lowest level since May 2005, and production expectations were the weakest in almost seven years, a European Commission survey showed. Renault is eliminating up to 6,000 jobs and trimming output. S&P cut its outlook for Europe's second-largest automaker to negative in July, amid "increasing uncertainty on Renault's ability to maintain sound cash generation." Also feeling a pinch is Helios Domzale d.d., a Slovenian paintmaker. Its first-half profit fell as orders weakened and debt costs increased. "We've had to reassess investment plans and postpone some for next year," Chief Executive Officer Uros Slavinec said in an interview last month. "More pain probably lies ahead," says Michael Saunders, chief European economist at Citigroup in London. "Worsening corporate finances add to downside risks to growth." A group of 23 senior employees at Fannie Mae - directors and executive officers - held about 3 million of its shares, according to a regulatory filing April 4. At the time, these shares were worth about $91 million. Today, they are valued at $2.97 million. Like hundreds of companies, employees at Fannie and rival Freddie Mac - employers known for their generous benefits in the Washington, D.C., area - were offered company shares as part of their compensation plans. Stock incentives were a big factor in determining compensation for senior executives at the two mortgage-finance giants. But the federal takeover of Fannie and Freddie to shore up their capital base, announced Sunday, included measures that have eroded values of existing shareholders, hurting the companies' employees and retirees holding these investments. In 4 p.m. EDT composite trading Tuesday on the New York Stock Exchange, Fannie stock was quoted at 99 cents, while Freddie shares were quoted at 88 cents. Both stocks have lost about 97% of their value this year. "There are a substantial number of employees at Fannie and Freddie who got paid in part through some sort of equity compensation," said Michael Beriss, a senior financial advisor with Ameriprise Financial Inc. (AMP). "I'd be surprised if most people, if they are still working there, were able to get out of the stocks in time." Beriss said that as of February, his clients who were working at Fannie held, on average, about $100,000 worth of the company's stock or roughly 3,000 shares through stock plans, excluding stock options or incentives that were yet to mature. Today, those holdings are roughly worth a paltry $2,970. Because the two companies have relatively small staffs, employees as a group are small stakeholders. Still, stock ownership has been a big part of the corporate culture at these companies. Top executives received the bulk of their multimillion-dollar pay packages in stock. Total compensation for Daniel Mudd, forced out over the weekend as chief executive of Fannie, was set at $12.2 million last year. He held 690,376 shares in the company as of March 21, according to the company's annual proxy statement. The value of those shares has plunged to about $683,000, from $23.7 million in March. Richard Syron, ousted as Freddie's chairman and chief executive over the weekend, had compensation of $18.3 million last year, including about $12 million in stock and options. He held 216,810 shares excluding options as of April 1. The value of that stock has dropped to about $191,000 from $6.3 million. In addition, both companies imposed restrictions on trading of company stock by employees as they worked on correcting a series of accounting misstatements. Fannie prevented employees from selling or buying shares from April 2005 to November last year, according to a recent New York Times report. Freddie restricted employees from trading its stock starting June 2003, providing small windows from time to time to allow them to sell shares, said the report. Those restrictions were loosened in March for most, but trading by many executives is still tracked and limited. The workers' "situation is worse than your typical employee who gets equity compensation. It wasn't loyalty to their stock, but their inability to sell that kept them holding the stock," said Ameriprise Financial's Beriss. Employees helplessly watching the worth of their shares vanish may draw parallels to the dramatic plunge in Bear Stearns Cos. stock in March. Bear Stearns, which employed 14,000, was about one-third owned by its staff. The company whose shares traded above $100 as recently as December was bought by JPMorgan Chase & Co. (JPM) for $10 a share. In another instance, workers lost heavily with the collapse of Enron, the energy trading giant that entered bankruptcy proceedings in December 2001 with accounting problems and billions in debt. In addition to thousands of jobs, more than $2 billion in pensions was wiped out. As of Dec. 31, 2006, according to most recent available data, Fannie had 6,400 active participants in its employee stock-ownership plan, according to data culled by Corey Rosen, director of the National Center for Employee Ownership, a nonprofit membership and research organization in Oakland, Calif. The plan had $ 116 million in assets, about 90% of which was Fannie stock. In addition, the 6,400 participants in Fannie's 401(k) retirement plan had $ 667 million in assets at the end of 2006. About 20% of that money came from Fannie, and the rest was employee contributions. Fannie stock wasn't among the investment options in the 401(k) plan. Freddie had $812 million in its 401(k) plan as of Dec. 31, 2006. About $64 million of that was Freddie stock. In addition to shares, incentives in the form of stock options will be rendered virtually worthless. "Given the current stock price, I think it is a safe bet to say that all of the outstanding stock options at Freddie and Fannie are now underwater and have no value," said Alexander Cwirko-Godycki, research manager at Equilar Inc., an executive-compensation research firm. "As such, I think there is zero chance that any employees, including executives who probably hold the bulk of these options, will receive any value or choose to exercise shares." According to Freddie's most recent annual report, at the end of 2007, the company's employees held a total of about 5 million stock options. These stock options, on average, would have been converted to shares at a price of $59.17. During the same stretch, Fannie employees had 17 million outstanding stock options. These options had, on average, a price of $71.90. "As the stock goes down, a company's ability to retain people who've been compensated with some form of equity is diminished," said Beriss. "What was a valuable asset is no longer there. They need to find some other way to retain those people with new incentives." Lehman Brothers Holdings Inc. is trying to sell its fund-management unit to cover further mortgage- related writedowns. If it does, what's left won't be worth much, based on how investors value the firm. Lehman's market capitalization of $11.2 billion is almost equal to the value of its asset-management arm, which includes Neuberger Berman Inc. That leaves its main business of trading stocks and bonds as having little worth. The numbers are similar for Merrill Lynch & Co.: Take out its retail-brokerage and asset- management businesses, and the investors' valuation of the rest of the third-biggest U.S. securities firm is zero. After being the most profitable business on Wall Street, generating more than $65 billion in pretax profits for the four largest U.S. securities firms between 2002 and 2006, trading has become a black hole. It still accounts for about half of the revenue at the Wall Street firms. Yet Lehman Chief Executive Officer Richard Fuld and Merrill CEO John Thain have been unable to convince shareholders to attach a value to the businesses. "We're standing at one edge of the Grand Canyon, looking at the other side," said Brad Hintz, an analyst at New York-based Sanford C. Bernstein & Co. and a former Lehman finance chief. "I can see a rejuvenated fixed-income market and Lehman as one of the major players in that market at the other side, but we don't know how deep the canyon is. And we have to get through the canyon to get to the other side." Lehman's asset-management unit is worth about $8 billion, based on the amount of cash it manages for clients, compared with publicly traded rivals such as New York-based BlackRock Inc. or Federated Investors Inc. of Pittsburgh. That leaves less than $3.5 billion for the rest of the fourth-largest U.S. securities firm. Merrill's retail-brokerage division is worth about $29 billion, based on earnings multiples of comparable publicly traded brokers, while its 49 percent stake in BlackRock is worth $12 billion. That equals Merrill's market value. Morgan Stanley's retail brokerage could garner $19 billion and its asset-management business $17 billion, according to the same calculations, leaving about $10 billion for the rest of the second-biggest securities firm, including its trading business. Officials at the three New York-based firms declined to comment. The biggest reason for the depressed valuations is concern about writedowns on the companies' mortgage holdings. Merrill, Lehman and Morgan Stanley have written down $74 billion of their holdings tied to home loans, commercial real estate and leveraged finance for companies during the past four quarters, data compiled by Bloomberg show. Goldman Sachs Group Inc. analyst William Tanona estimates another $12 billion of losses for the three firms in the third quarter. Those probably will wipe out any trading revenue for the period. "Uncertainty requires a discount," said Roger Lister, New York-based chief credit officer for financial institutions at DBRS Inc., a Canadian credit-rating company. "Equity investors are worried about writedowns resulting in more dilution. That swamps longer-term valuations. Similarly, the credit-default swaps on these banks' debt are treated like junk." The losses have mostly been caused by the mortgage-related positions built while packaging loans into securities to be sold off. Merrill, the largest underwriter of collateralized debt obligations, and Lehman, No. 1 in mortgage-backed securities, ended up owning too many of the bonds themselves when investor appetite waned. Even when the credit market returns to normal, securitization will be a much smaller business for the brokers because they will have to scrutinize inventories more to prevent similar losses, said Samuel Hayes, professor emeritus of investment banking at Harvard Business School. "They've realized they need customers to trade with and to successfully underwrite securities," Hayes said. In the second quarter, trading revenue -- adjusted to exclude writedowns -- was down 41 percent from the previous quarter and 25 percent from a year earlier for Merrill, Lehman and Morgan Stanley combined. Goldman Sachs, which has managed so far to avoid the evaporation of earnings that its peers have encountered, was the exception: Its adjusted trading revenue was little changed. Goldman's writedowns, $3.8 billion so far, have been dwarfed by those of its three smaller rivals. Strip away Goldman's asset- management business, worth about $25 billion, and the rest of the firm, including trading, is valued at $45 billion. Fees from trading stocks and bonds for clients declined over the past three decades as improvements in technology and access to information reduced the role of brokers. To make up for the shortfall, Wall Street firms turned to proprietary trading, or taking positions with their own capital. Though more profitable, proprietary trading is also riskier, and some of those positions blew up during the credit crisis. Most of Morgan Stanley's writedowns have come from mortgage-related assets acquired, not originated, by the firm. "Before the 1980s, trading was the poor brother of investment banking, but then it overtook everything else," said Charles Geisst, author of "100 Years on Wall Street" and a finance professor at Manhattan College in New York. "Wall Street has to look for other profit centers for a while, but it'll never give up trading, including prop-trading." Between 2002 and 2006, investment banking made up less than 20 percent of average total revenue for the four largest securities firms. Trading accounted for as much as 70 percent during some quarters before declining to about 50 percent last quarter. Geisst said it may take as long as 10 years before trading revenue numbers catch up to peak levels in 2006 and 2007. Lehman would be crippled more than its rivals if it sold its asset-management division, he said. While Morgan Stanley and Merrill have retail-brokerage divisions to bring in revenue, Lehman would be hard-pressed to replace the income it earns from asset management. Investors are having a hard time valuing the rest of the business at Lehman because there's no transparency about the mortgage securities on their books, said Janet Tavakoli, author of "Credit Derivatives & Synthetic Structures." Lehman, Merrill and Morgan Stanley borrowed heavily to fund their mortgage investments, which is coming back to hurt them, she said. The three investment banks' total assets were about 30 times their capital levels last year. "When you're highly leveraged, you need to be very careful about the quality of your fixed-income assets," said Tavakoli, president of Chicago-based Tavakoli Structured Finance Inc. "Even if you held Treasuries, you could lose big money when interest rates moved against you. When you take credit risk as well, which was the case with mortgage bonds, then you're really in trouble." "I don't think it's just coincidence that the money came out after the pressure was put on these folks," Masters, who wants legislation that would set limits on index commodity holdings, said in an interview. Crude oil futures surged to a record $147.27 on July 11, an increase of 53 percent for the year, on the New York Mercantile Exchange, then fell 26 percent to $109.71 on Sept. 2. Oil dropped $3.08 to $103.26 yesterday on the Nymex. The commission is expected to release a report tomorrow that will lay out its findings on the impact of index investors and over-the-counter trading on commodities. Regulators may require Wall Street banks to regularly disclose their energy futures positions connected to the unregulated swaps market, according to people familiar with the discussions. JPMorgan Chase and Co., Goldman Sachs Group Inc., Barclays Plc and Morgan Stanley control 70 percent of the commodities swaps positions, and swaps dealers are the largest holders of Nymex crude oil futures contracts, Masters said. Representatives for all four banks declined to comment. Banks enter into swaps with airlines and hedge funds to profit from moves in crude prices and then offset some of that risk in futures markets such as the Nymex. "These large financial players have become the primary source of the recent dramatic and damaging price volatility," Masters said in the report. The commission has put out special requests for information from traders and imposed limits on the number of U.S. oil futures contracts a trader can hold on Intercontinental Exchange Inc.'s London-based ICE Futures Europe market. Critics of Masters's earlier work said he lacks access to the data needed to draw his conclusions. His hedge fund is based in the U.S. Virgin Islands. Walter Lukken, the acting chairman of the commission, is among those who question the validity of Masters's data. "Just as weather forecasters have no effect on the weather, energy speculators have no effect on the price of oil," said Scott Talbott, a lobbyist for the Financial Services Roundtable, which represents investors. "His fallacy is that he ignores the laws of supply and demand, which determine the price of oil." Masters earlier this year reported that index speculators such as those that trade on Standard & Poor's GSCI accounted for $260 billion of assets, up from $13 billion in 2003. As of Sept. 2 that number was down to $223 billion, Masters said. "For the supply and demand people, what I would like for them to explain is how from the supply-and-demand rationale you could have oil at $95 in January, at $150 in June and back to $100 in September," Masters said. Masters's hedge fund held shares in the four major U.S. airlines, AMR Corp., Delta Air Lines Inc., US Airways Group Inc. and UAL Corp, according to a June 30 regulatory filing. Airlines hedge oil and have been hurt by commodity price fluctuations. He said he extrapolates his numbers from agricultural data, which is publicly available, to arrive at overall numbers that include oil futures investments. In arguing for legislation, lawmakers, primarily Democrats will point to the Masters report and a Massachusetts Institute of Technology report released in June alleging that speculation caused the rise in energy prices. "Why did so much money come into these markets and why is it leaving," asked Senator Maria Cantwell, a Washington Democrat, in an interview. If Congress reduces scrutiny, "do we see the run-ups happening again?" Mexican President Felipe Calderon has taken his plans to loosen the government's grip on Petroleos Mexicanos about as far as he can. It isn't very far. Mexico's Congress wouldn't even consider his idea of allowing private investment in the constitutionally protected oil industry. Instead, lawmakers this year are likely to pass only a measure making it easier for state-owned Pemex to hire outside service contractors. Such a move would fall short of the president's aim to use investors' capital to expand exploration as output slides by 12 percent a year. Nor will it help Mexico, which relies on oil for 38 percent of its federal revenue, win a credit-rating upgrade that would lower borrowing costs as its stock, bond and currency markets lag behind Latin American peers. "Mexico's not going to be the new Brazil any time soon," said Edwin Gutierrez, portfolio manager at Aberdeen Asset Management in London, which oversees $5.5 billion in emerging- market debt. "The home run requires constitutional reform" relaxing the government's oil monopoly, he said. "The potential could be substantial in Mexico." The Americas' second-biggest oil producer in 2007 and the U.S.'s third-biggest supplier, Mexico saw output at its crucial Cantarell field plunge 29 percent in the first half of 2008 from a year earlier, a result of dropping pressure in its aging wells. Cantarell accounted for 35 percent of the company's total production of 2.78 million barrels a day in July. Pemex's revenue, $104 billion last year, would be $20 billion higher in 2008 had the company managed to maintain output, according to Energy Ministry data. Slumping production may force Pemex to import light crude for its refineries by 2011. "It's difficult to understand why there is so much resistance" to private capital "in the face of collapsing oil reserves," said Jaime Valdivia, who manages $1 billion in emerging market assets for Emerging Sovereign Group in New York. If the country opened its oil industry to private capital and technology, Pemex and Mexican sovereign bonds would rally, said George Estes, the sovereign risk analyst for $5 billion of emerging market debt at Grantham Mayo Van Otterloo Co. in Boston. In the past five years, the Mexican peso has gained 3.7 percent against the dollar while Brazil's real strengthened 64 percent. The Colombia Stock Exchange's IGBC Index soared 513 percent in dollar terms over that period, trouncing the Mexican Bolsa index's 243 percent gain. Brazil's dollar bonds, once among the riskiest in Latin America, now are considered almost as safe as Mexico's, as measured by investors' yield demands. Today, Brazilian bonds yield 69 basis points more than Mexican bonds, down from a spread of 451 basis points five years earlier, according to JPMorgan Chase & Co. data. "They aren't taking advantage of the fact that right now investors would want to participate," Estes said. "The energy reform is overdue, but the proposal doesn't go far enough." Calderon, 46, has proved a savvier negotiator with Congress than his predecessor, Vicente Fox, whose legislative efforts were stymied by the opposition. Calderon has passed measures to cut spending on pensions, modernize the courts and wring more revenue from the tax code. His Pemex legislation has been a tougher sell. The bill sent to Congress in April -- after his initial, more ambitious idea to loosen constitutional protections was shot down -- would let Pemex hire contractors to help produce, refine and transport oil as well as search for new deep-water deposits in the Gulf of Mexico that the government estimates hold 30 billion barrels of oil and gas. Lawmakers say the bill will probably be watered down more. A final draft may be ready by the end of this month. "This is going to be a light energy reform," said Alejandro Hernandez, who oversees 10 billion pesos ($965 million) in fixed-income assets at Grupo Financiero Interacciones SA in Mexico City. "It's not going to be what the country needs." Winning support to relax the monopoly was difficult because mid-term elections are looming next year. No issue stirs more political emotion in Mexico than changing Pemex, which has had exclusive rights to the energy business since the country expropriated U.S. and U.K. assets in 1938. The debate comes during escalating power struggle involving the country's three main parties, none of which has a majority in either chamber -- Calderon's pro-business National Action Party, or PAN; the populist Party of the Democratic Revolution, or PRD; and the Institutional Revolutionary Party, or PRI, which dominated Mexican politics from 1929 until the election of PAN's Fox as president in 2000. The PRI led the opposition that forced Calderon to drop his original plan to change the constitution and let Pemex form partnerships with foreign and private oil companies, possibly allowing them to a own stake in newly discovered reserves, Pemex Chief Executive Officer Jesus Reyes Heroles said July 24 in an interview on Radio Formula. After Calderon submitted his legislative proposal in April, PRD lawmakers opposed to the bill stormed the lower house podium, camped out in sleeping bags on the chamber's floor to close off debate, chained the building's doors shut, and mobilized women backers to form a human barricade around the Senate. Ilargi: The hits for the Brits keep on coming. Huge losses in preperty values, equally huge hikes in energy prices, and now food will be much more expensive. This will not be a nice winter. Britain is facing its worst harvest for at least 40 years as 30 per cent of the country’s grain lies in waterlogged or sodden ground. Hilary Benn, the Rural Affairs Secretary, is expected to give the go-ahead today for farmers to salvage what is left of their crops by using heavy machinery on wet fields. European Union rules ban farmers from using combine harvesters on wet land to protect soil quality. Those who flout the ban can be prosecuted. The exemption is expected to last for about three weeks. The poor harvest is unlikely to lead to a rise in the price of bread, cakes, biscuits and flour, however. Gordon Polson, director of the Federation of Bakers, said that although much of the milling wheat was of a poor quality it could still be used for bread and flour. He said: “The poorer wheat means it has less protein, but manufacturers can add gluten to ensure the proper quality for making bread. We are not happy and we may still have to import some milling wheat, but no one is talking about price rises for bread.” The harvest has been most badly affected in the North East, especially Northumberland, North Yorkshire and Co Durham, where the heavy rainfall and flooding have meant that on many farms less than 50 per cent of the wheat has been harvested. Farmers stand to lose as much as £30,000 each because much of the grain in the soil is suitable only for animal feed. The price of this lower-quality grain has dropped from £120 to £100 a tonne in a month; best milling wheat is valued at £140 to £150 a tonne. There is also concern about next year’s harvest. Unless farmers clear this year’s crop within the next two weeks many will be unable to prepare the ground and plant new seed. Simon Ingle, a wheat trader at Grainfarmers, which buys 20 per cent of home-grown wheat, said: “We are still hoping yield will be up, but this harvest is the worst I have known since 1982. Many crops will be lost and the price of this lower-quality wheat may continue to fall.” Mr Ingle added that Britain was the country worst affected in Europe and that most European countries completed their harvests last month. Residents of Totnes, a town of about 8,000 people in southwest England, are so worried about the economy's future that they've created their own currency. "When times have got difficult in the past, local currencies have been one of the tools communities have used to get out of trouble," said Robert Jackson, 58, a member of the Totnes pound project. As U.K. inflation accelerates at the fastest pace since 1991 and the pound trades near a record low against the euro, Totnes is leading a drive among communities to create alternatives to sterling. Supporters say the currencies will keep money in local economies and bolster stores' sales. The Totnes pound started circulating last year. The town of Lewes, in southeast England, will introduce the Lewes pound today. London's suburb of Brixton has used the "Brixton brick" on a trial basis and plans full implementation of the currency in 2009. "A local currency can foster better trading locally and possibly create a better sense of community and belonging in terms of a local economy," said Daragh Maher, deputy head of currency strategy at Calyon, in London. "If it's taken up in a bigger way locally it could have a significant local influence but on a national level it will remain relatively small." While the currencies aren't legal tender, they also aren't prohibited as a system of payment. In England and Wales, only Bank of England notes are legal tender, according to the Bank of England's Web site. "The term legal tender does not in itself govern the acceptability of banknotes in transactions," the Web site says. "Whether or not notes have legal tender status, their acceptability as a means of payment is essentially a matter for agreement between the parties involved." The local currency notes are banned from carrying a picture of the monarch, who appears on all sterling notes and coins. The national currency was first introduced in England by the Normans in the 11th century. Totnes and other towns with local currencies are members of the "Transition Towns" network, which was started in 2007 to boost local economies and raise awareness about sustainable living. There are now 100 "Transition Towns" worldwide, including Totnes, Lewes and Brixton, the group's Web site says. "It's fantastic to have more communities creating local currencies as we enter rapidly into the unfolding credit crunch and in terms of localizing our economies," said Rob Hopkins, the group's founder, in an interview. In Totnes, there are about 5,000 notes in circulation. Each Totnes pound note is about the size of a U.K. 5-pound note, and bears images of the town and the words "redeemable for goods and services at designated businesses." The currency is backed by the equivalent in sterling, kept in a town bank account. The exchange rate is one for one. Shoppers can buy and sell Totnes pounds at five local stores and use them in about 65 shops and restaurants. Lee Hardman, a currency strategist in London at Bank of Tokyo-Mitsubishi Ltd. said the idea won't spread widely. "For a currency to enter widespread circulation, it has to have the confidence of an extensive number of people," Hardman said. "So it is unlikely to have anything other than a novelty value." The pound fell to a record low against the euro last week after Chancellor of the Exchequer Alistair Darling said Britain faces "arguably the worst" economic conditions since World War II. The Totnes pound has been "fantastic," said Julie Hore, 51, the manager of the Greenlife food store, which accepts the currency. "It creates communication between all the shops in the town and it adds to that community feel." Because the local currencies are backed by sterling, they can't escape fluctuations in the pound. "It was only ever intended as an experiment," Jackson said. "The next step is to find a way to back the currency with something other rather than pound sterling." Both Jackson and Oliver Dudok van Heel, one of the organizers of the Lewes pound, plan to choose another asset to support the currency. "That would create a parallel economy," said Dudok van Heel. In Totnes and Lewes, organizers are trying to figure out how to back the notes with a local product people always need. Jackson said Totnes was investigating ways to generate its own energy. "One unit of Totnes currency could be backed by one unit of energy," he said. "It's a brilliant idea," said Mike Sealey, 51, owner of Totnes Pet and Garden Stop. "It's used sometimes as an inter- trader currency. If one trader can't get rid of them they will go to another knowing that they will accept them. We all know that lots of places will accept them." Complementary currencies are features of crises, according to Josh Ryan-Collins, a member of the Brixton currency team and researcher at the London-based New Economics Foundation. In 1932, the Austrian town of Worgl introduced an emergency local currency as money shortages and unemployment ravaged the national economy. A year later, unemployment had fallen by 25 percent in the town while other areas continued to suffer, according to a translated and abridged version of "The Experiment in Worgl" by Fritz Schwarz. Sterling was adopted as the Royal Chartered Bank of England's currency in 1694, according to financial data provider ADVFN Plc. Lewes plans to print 10,000 notes and issue about 5,000 today, said Dudok van Heel. The notes also will be backed by sterling, which will be stored in a safety deposit box. People will be able to buy and sell the Lewes pounds at three points in the town including a Barclays Plc branch. They can use them in at least 40 locations in the town. Brixton plans to have its currency fully circulating by the end of next year, said Ryan-Collins, a member of a community project currency team in the inner London suburb. "If we go into a recession I think we are going to see a lot of this going on," said David Boyle, a fellow of the New Economics Foundation. "People need money and they will use whatever is close to hand." In Totnes, Jackson is looking at what the town can do next with the currency. His team is considering a credit card. "Part of the idea behind the Totnes pound is to demonstrate that it can work before we need it," Jackson said. "We've proved we can." ilargi, the sequence of today's date seems like a con. Was that intended? It is interesting today that you mentioned 2 of Ohio's banks that are troubled: Fifth Third and Keybank. Unfortunately, we have accounts at both. We didn't start out with these regional banks. Our local savings & loan was bought by 5th3rd, and Keybank morphed out of Society which morphed out of 3rd National Bank. Spouse and I have been slowly drawing out cash, and redeeming CDs to purchase short term Treasury Bills. So we don't have large amounts at either bank, they are mostly used for electronic bill paying. For several months, we have thought that if either bank failed, or both, that the FDIC would transfer the accounts to whatever bank it's going to be. We've been thru these bank mergers several times with seamless transparency. But if the FDIC takes over, should we expect the same smoothness of transactions? Besides, with more and more banks failing, how would one determine a different bank that wouldn't fail at some point in the future? P.S. We also joined a local credit union as a back-up, but no one really knows if that is a safe alternative either. At what point do PMs become preferable to cash? I know they probably won't beat inflation, but I they might keep up. In other words, Ilargi mentioned specific signs that would signal the possibility of deflation winding down. I know this will likely take quite a while, and whether we come out of it with a financial system that resembles the current one in an meaningful way is quite doubtful. My question about PMs is whether people will start treating them as money, as goldbugs are fond of predicting. Is there any precedent for this in other meltdowns? At the end of the day I think productive land/goods are where its at, but I'm curious. A cartoon model of the crisis. I can find bad news everywhere now, much like during the spring when the market went DOWN. I suppose most headlines are after the fact rationalizations, so if the markets are falling the reporters tag it with something downbeat. I posted a question the other day (anyone with expertise could answer, I don't expect Ilargi and Stoneleigh to field every single question), about "debt deflation". Krugmann in the NY Times (on Sunday?) wrote an article where he essentially said, "watch out, debt deflation might be coming and if it does it can be nasty". My guess was that removing currency from circulation would be inherently deflationary since it would drive the relative value of each money unit higher. Is hoarding cash or governmental repossesion/repudiation of some currency what Krugmann is trying to steer clear of by saying "debt deflation"? Or perhaps he just wants to sound smart and not scare people by saying outright "deflation is on board now". Perhaps he's hedging. As wamu is the bank I use,I have been making a habit of leaving as little as possible...like gas money and "pay as you go" "business"transactions....I have known how shaky these dudes were for a long time,but,as my wife says,"They are all bankrupt,and all try to screw you from day one.Take your pick.Wamu is at least nice to its customers. "[At least they have been so far]. All appears normal at 5th3rd and Keybank too. Business as usual. Never had any issues with either bank. Thomas Friedman has his new book out; on how the US should "grow" its way out of peak oil, global warming, and anything else bad. It's called "Hot, Flat, and Crowded". whoo hoo. He finally understands that yes, there ARE some real problems here. yay. He's still selling the idea though that free enterprise (choke/giggle/snort); with just a little bit of wise government support (gasp/gag/boggle) can and will enable us to float over all difficulties, and keep our hydrogen powered SUVs. Hope, he's selling; and I'm afraid he actually believes it. I'm contemplating writing a response; "Friedman's Brain: Overheated, Flat, and Empty". not much audience, though. sigh. Krugman is trying to distinguish between deflation as we discuss it here (a collapse of the money supply due to deleveraging and the evaporation of credit) and what others often call deflation (falling prices). 'Debt deflation' is his term for the monetary phenomenon, while so-called 'price deflation' is a blanket term that isn't very useful for the purpose of understanding what is going on. Relative prices change all the time for a large number of reasons. You're right about headlines by the way - they're mostly rationalizations after the fact. People look for proximate causes for everything on the assumption that news drives market moves, whereas it's closer to say that market moves drive news (and better still to say that collective mood drives both market moves and the perception of events that shapes headlines). We're rapidly approaching a cascade in the markets, as the market failed to break the August 11th high following the nationalization of Fannie and Freddie. Therefore expect the headlines to get much darker and more apocalyptic over the next couple of months. Collective mood has changed to pessimism/fear, which greatly changes the way events and circumstances are perceived. It wouldn't surprise me if some significant international event occurred (hurricane, earthquake, Georgia, Iran???) and was blamed for the upheaval, although the connection will be spurious since the decline appears to have already begun. Commentators blamed 9/11 for a sharp decline, but in fact that decline had also been well underway for several weeks when the attack happened. Looking at a stock chart 9/11 doesn't exactly stand out as you might expect, and nor do other significant news events. Stoneleigh- we did watch the movie. Plenty of good stuff there. Son Beelar, just finishing a PhD, summed up : "well, it's annoying." :-) Substantial praise. Like someone else here, I'm kind of choking on the Fibonacci stuff, and I have worries about correlations and causalities; but- lots of good things to chew on. Thanks.